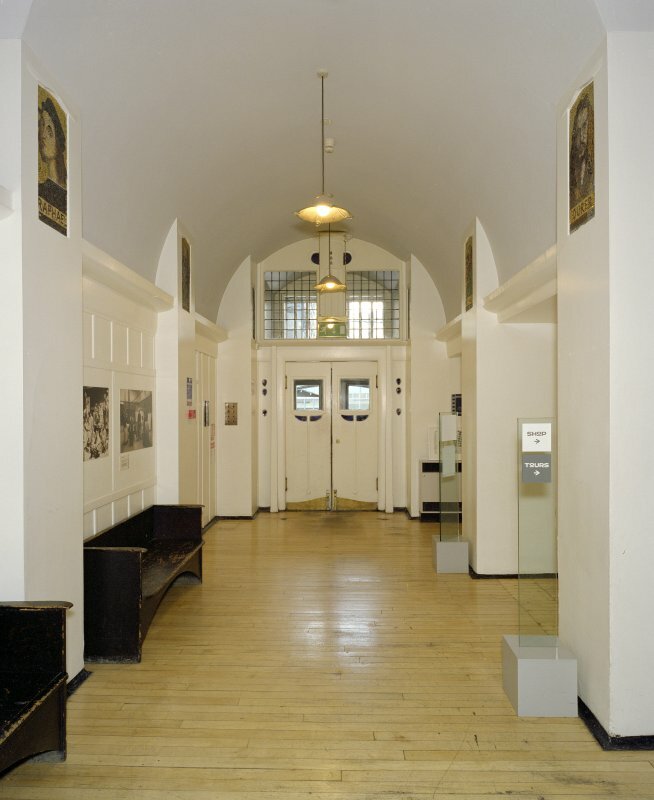 Photograph of exterior of School of Art. 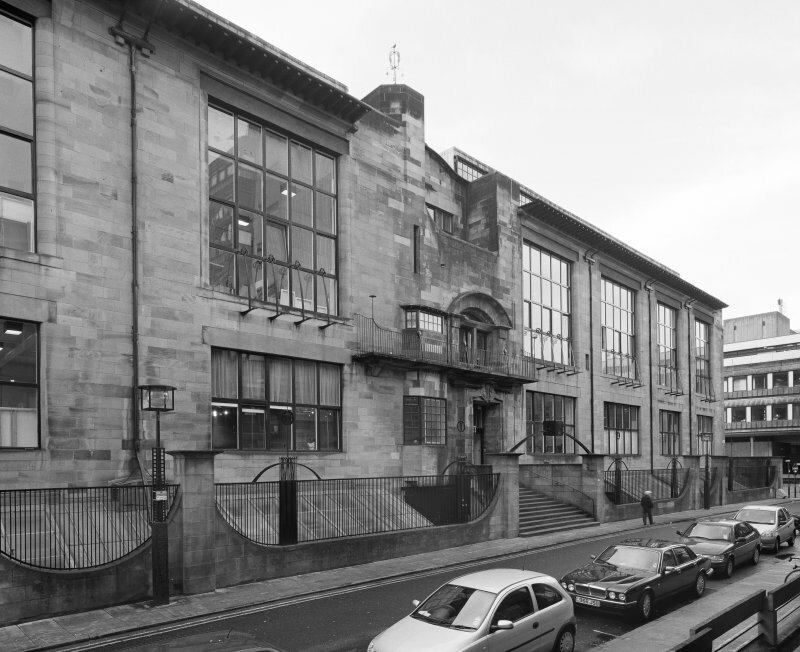 View of Glasgow School of Art from North East. 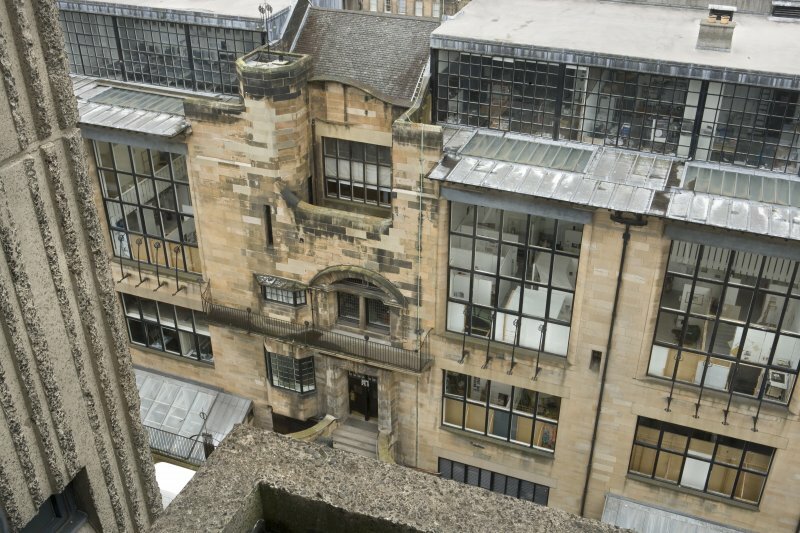 View of Glasgow School of Art. 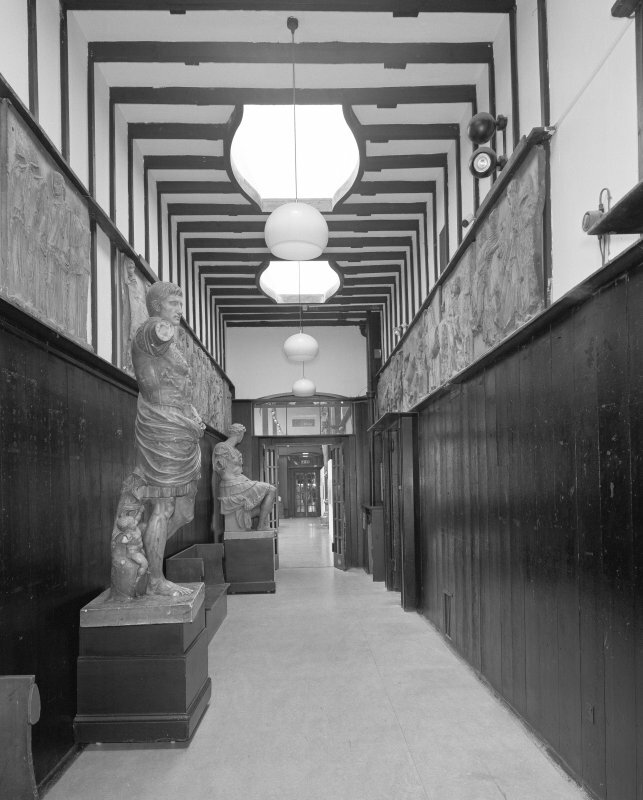 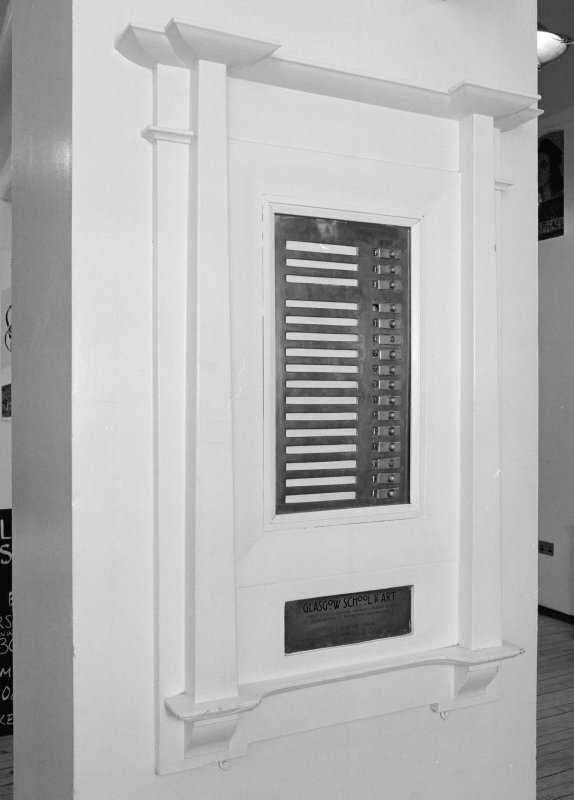 Interior view of Glasgow School of art showing detail of in/out board in ground floor entrance hall. 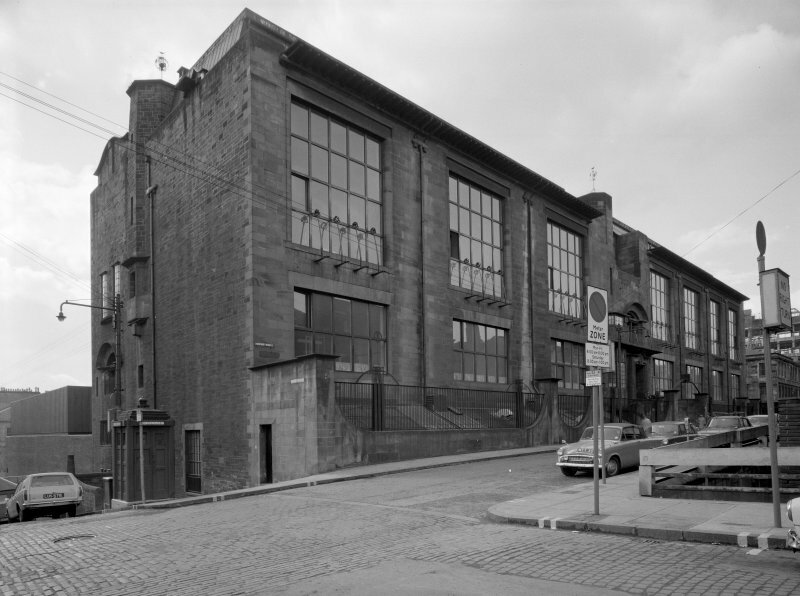 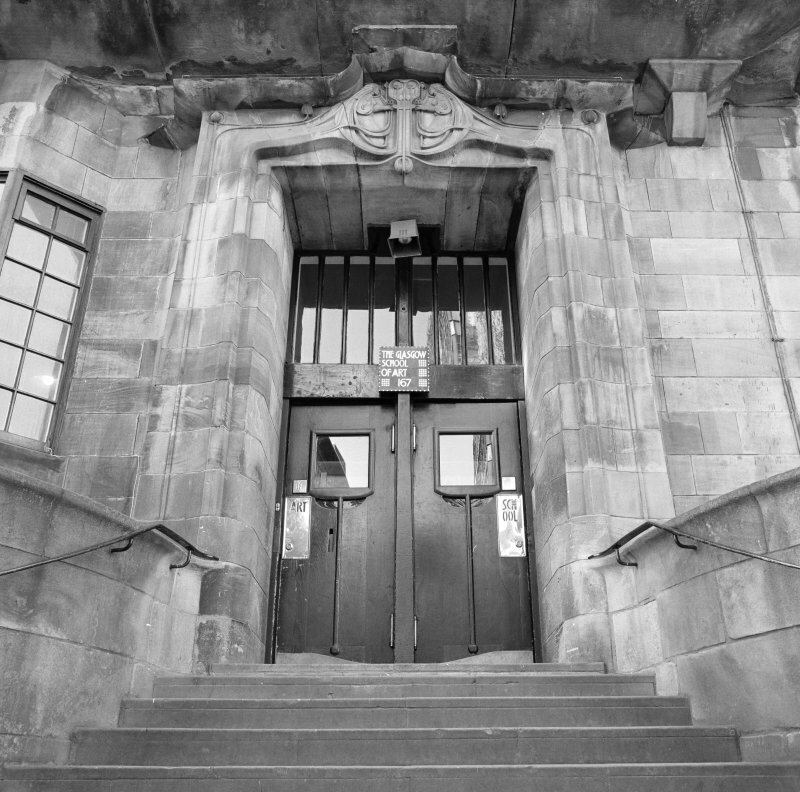 View of doorway at W facade of Glasgow School of Art from NW. 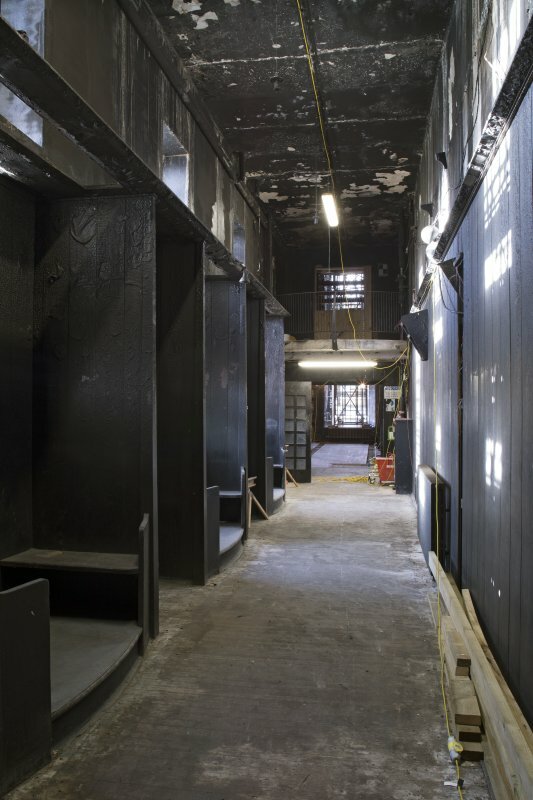 Interior view of Glasgow School of Art showing basement, storeroom to N of studio from NW. 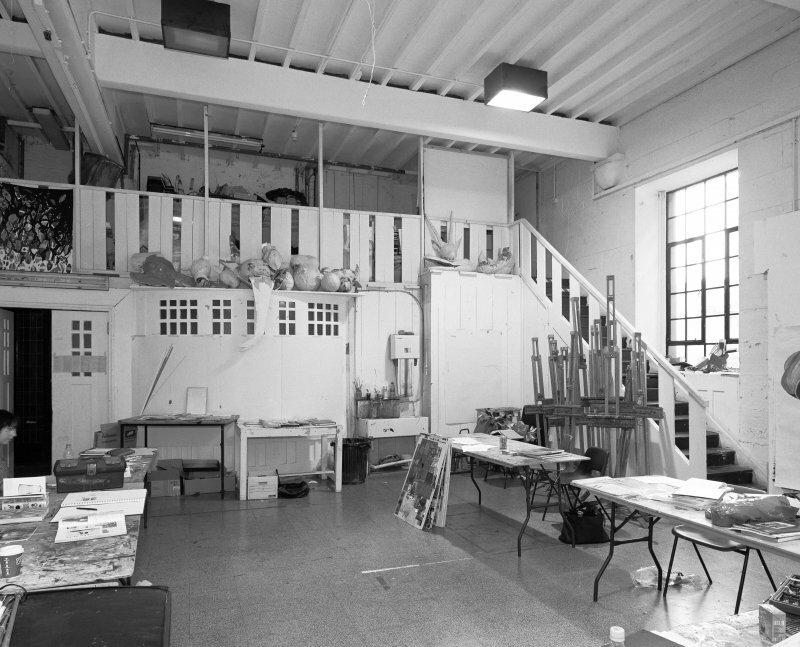 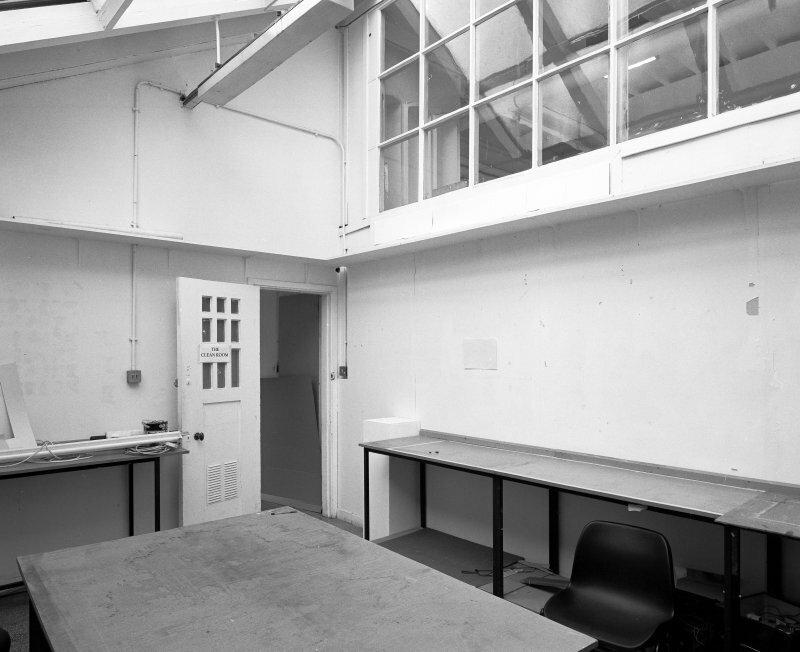 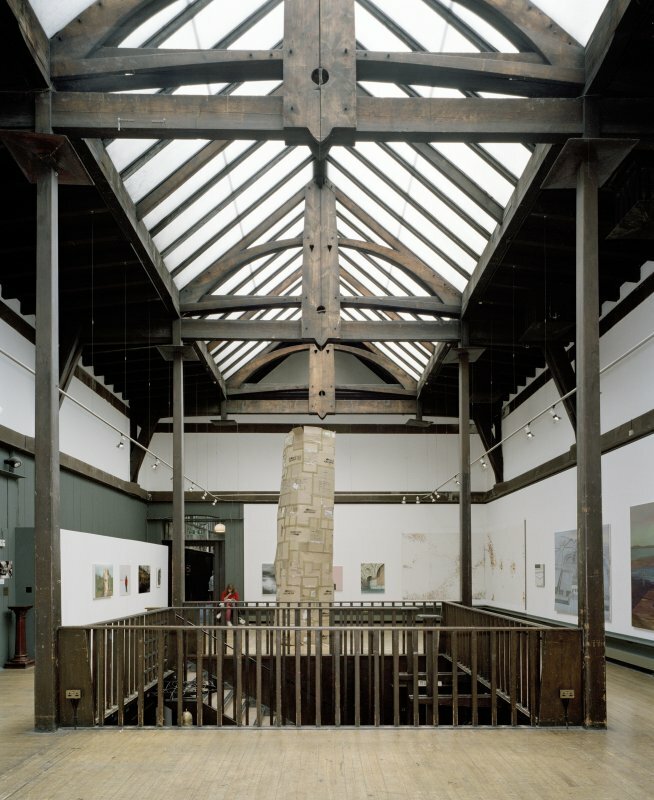 Interior view of Glasgow School of Art showing NW studio with mezzanine in basement from N.
Interior view of Glasgow School of Art showing E studio in basement from NE. 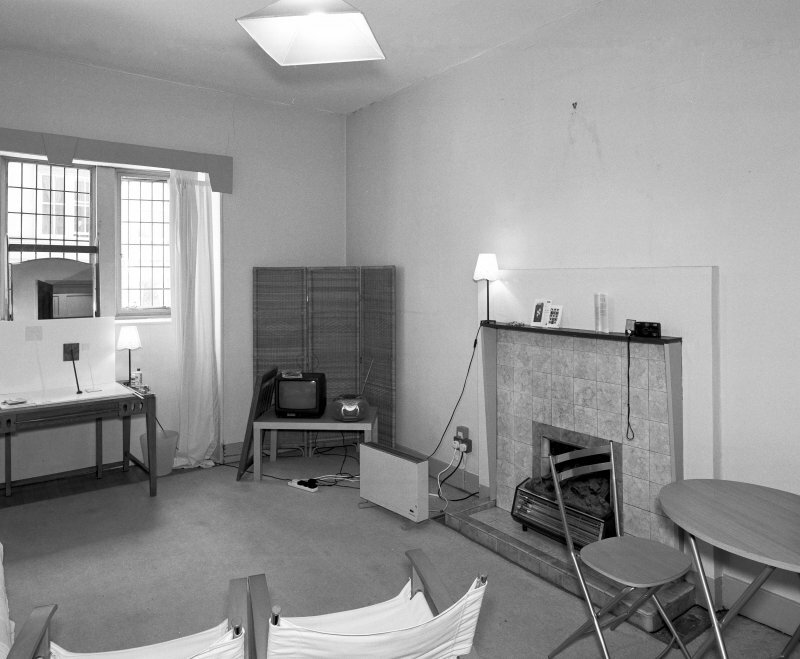 Interior view of Glasgow School of Art showing basement living room in visitor's flat from NW. 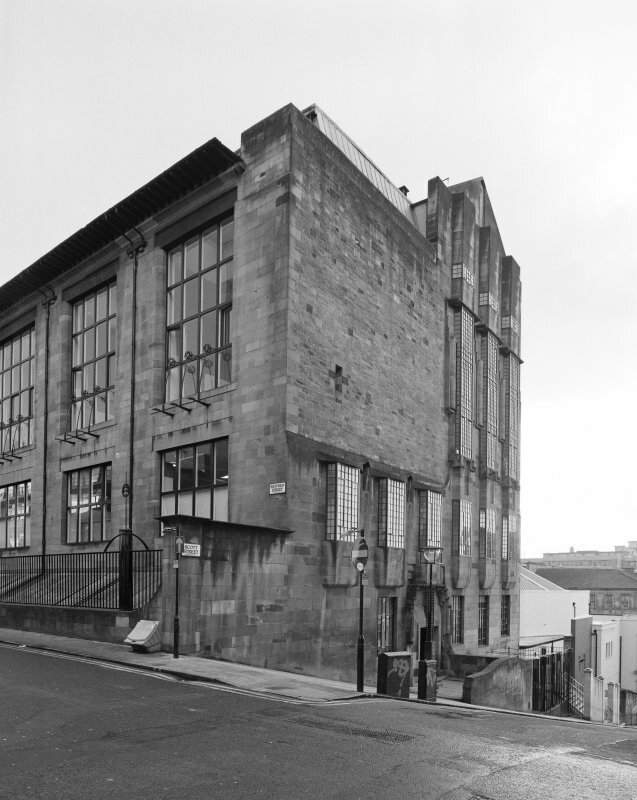 View of Glasgow School of Art from NE. 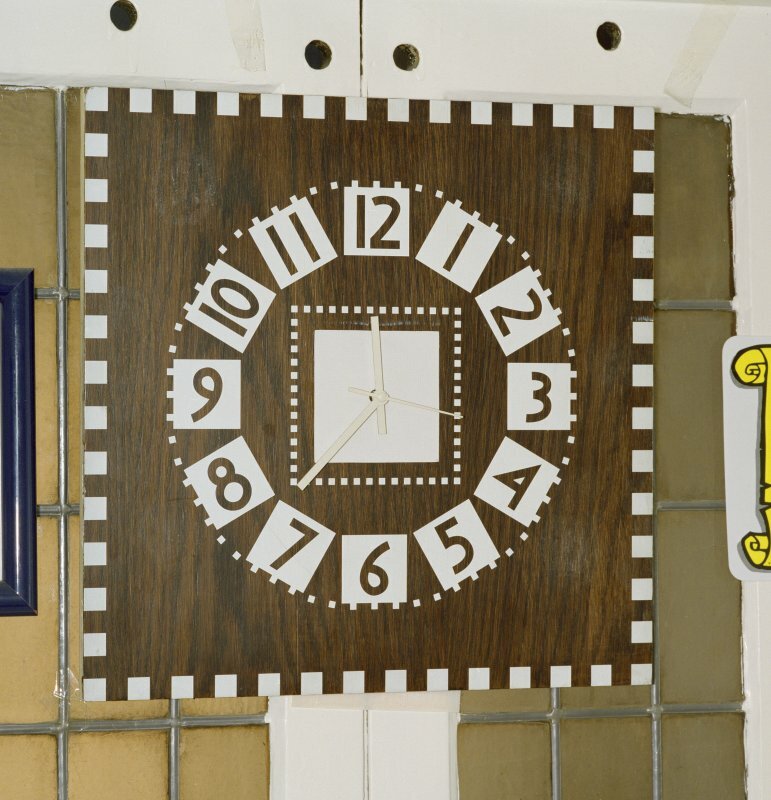 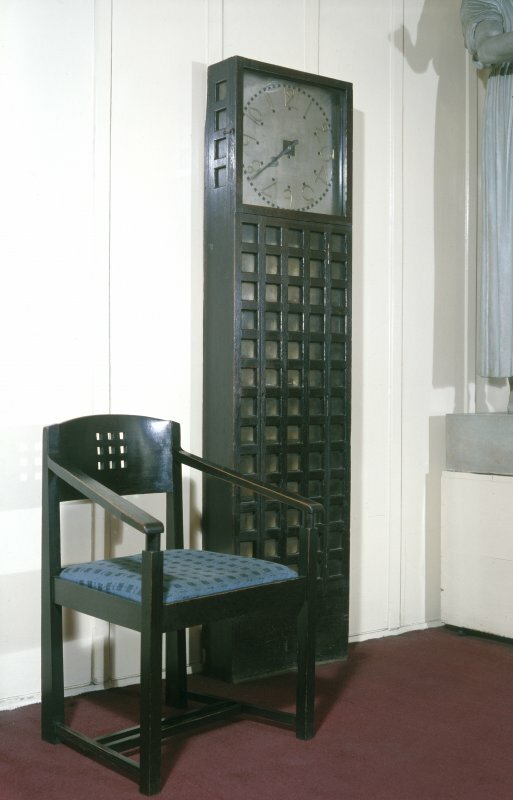 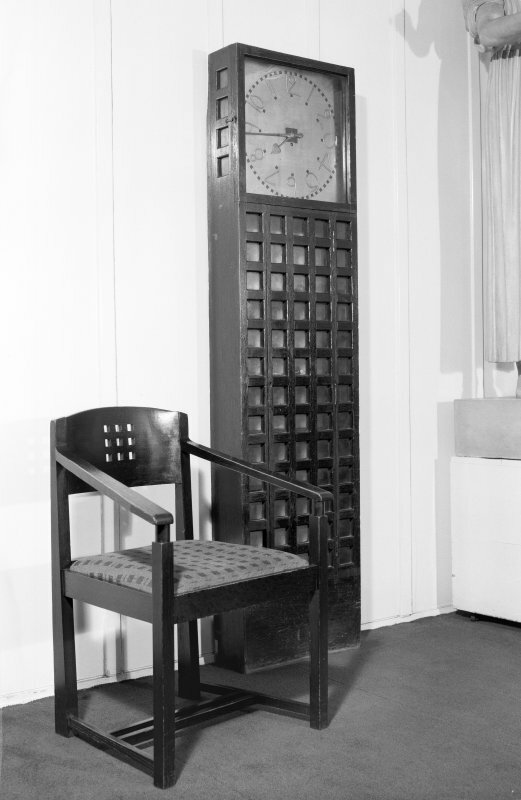 View of clock and chair in Glasgow School of Art. 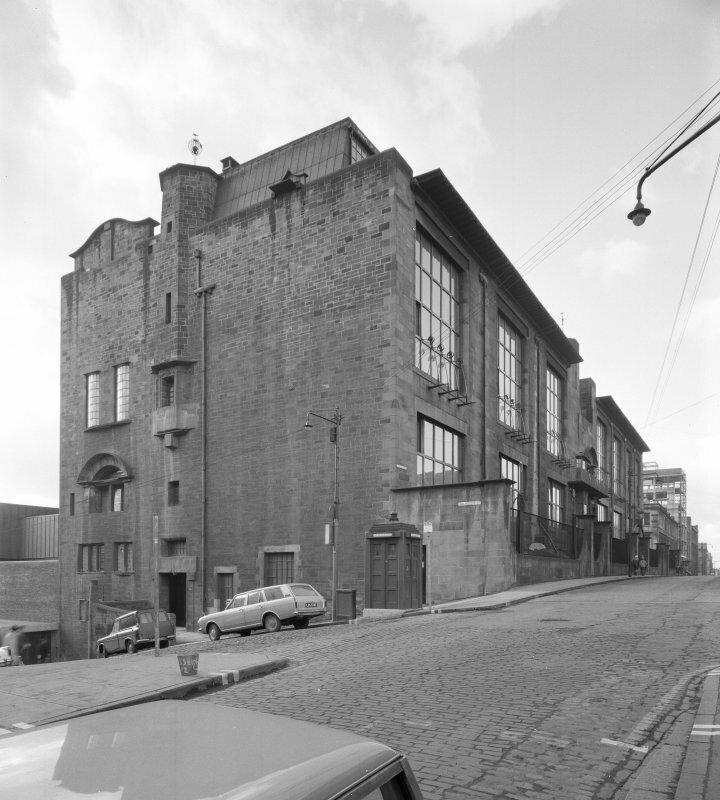 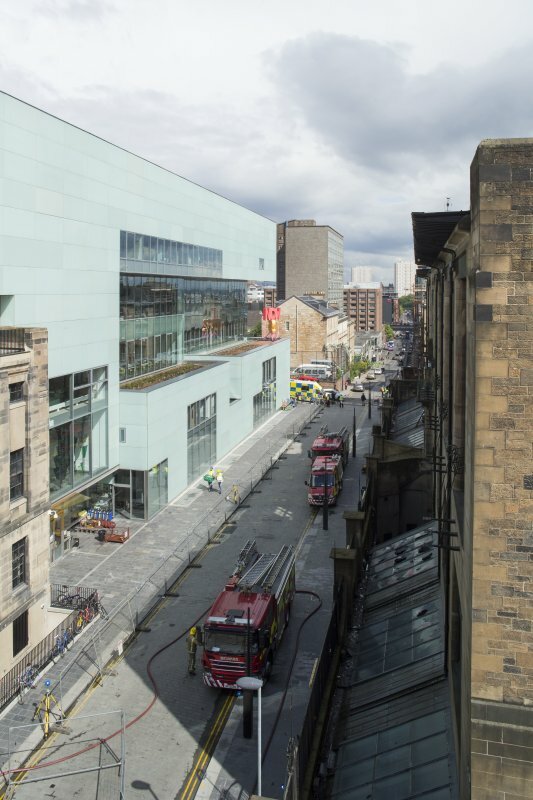 View looking east along Renfrew Street, showing the fire engines outside the fire damaged Mackintosh building. 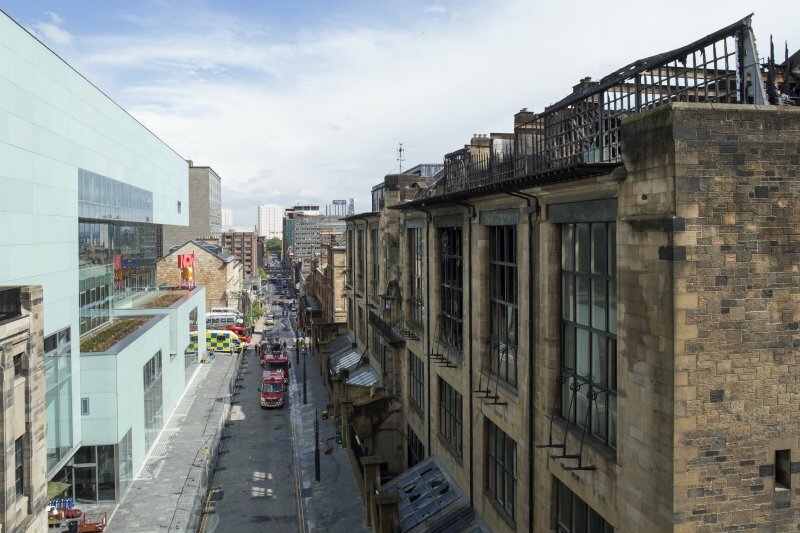 View looking east along Renfrew Street showing the first damaged Mackintosh building and the Reid building opposite, taken from the roof of the Bourdon building. 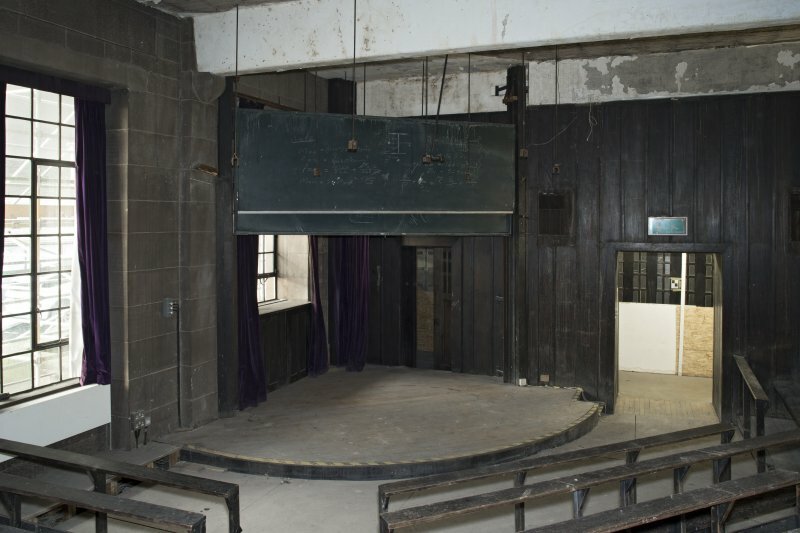 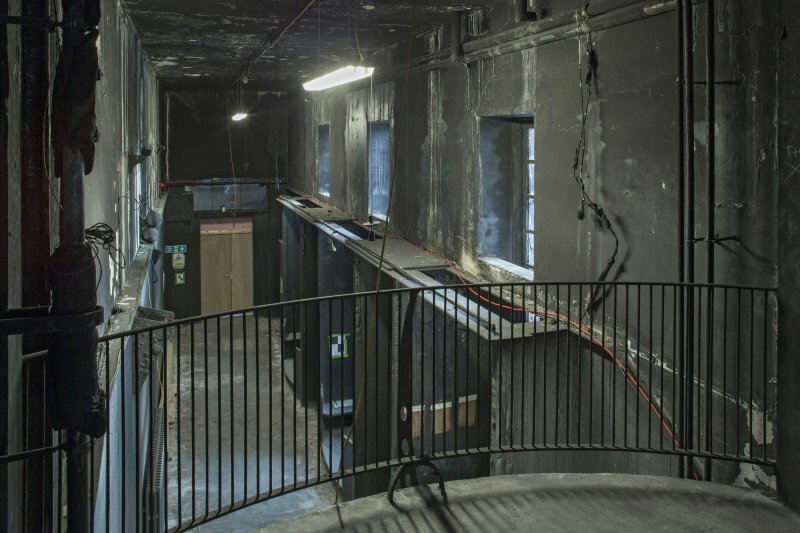 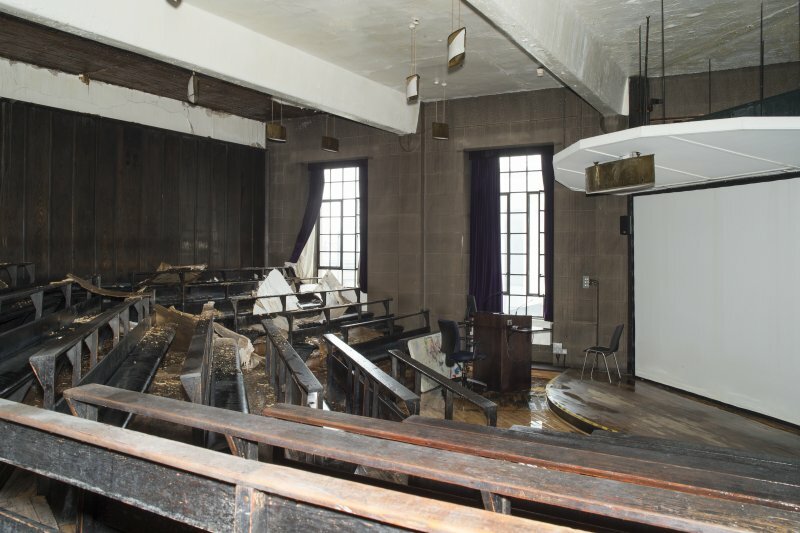 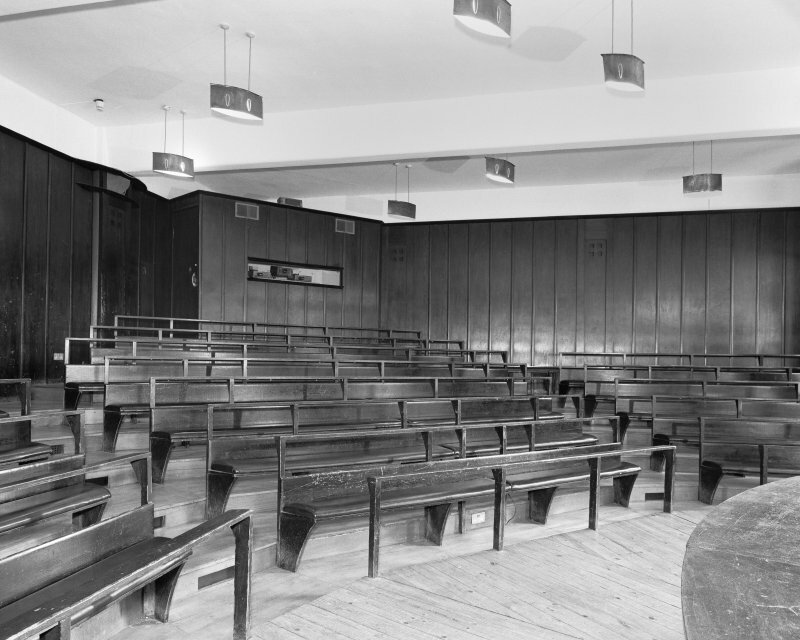 View of lecture theatre in the west basement of the Mackintosh building, with some damage resulting from the fire. 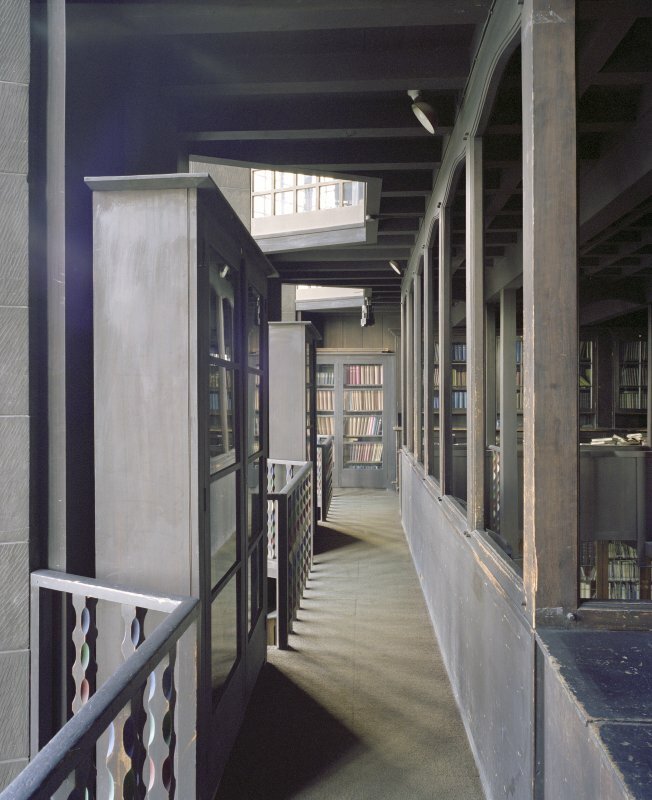 Interior view looking down into the fire damaged library of the Mackintosh building. 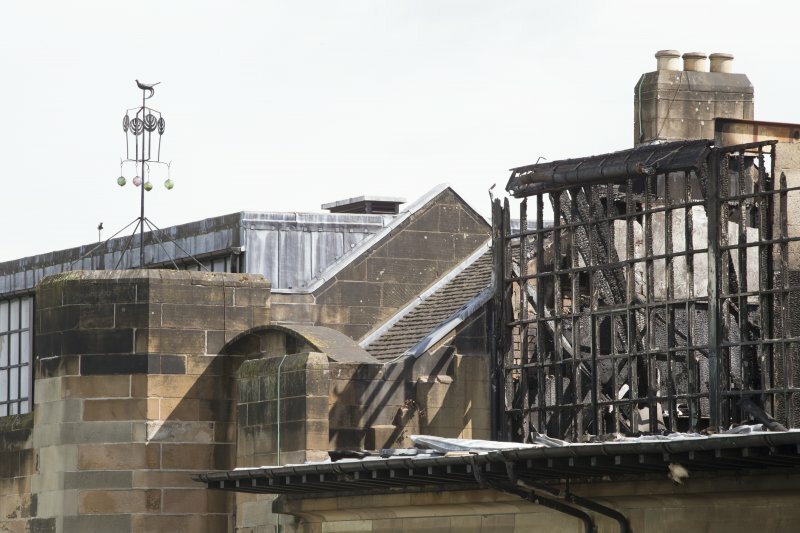 View of the fire damaged library windows and architecture studio windows below, taken from the north west on the Bourdon building roof. 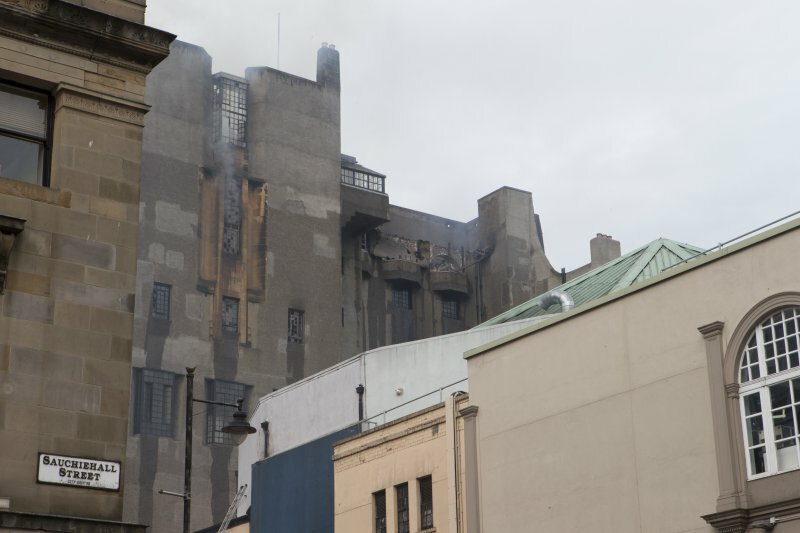 View of the fire damaged west end of the Mackintosh building, taken from the north-west. 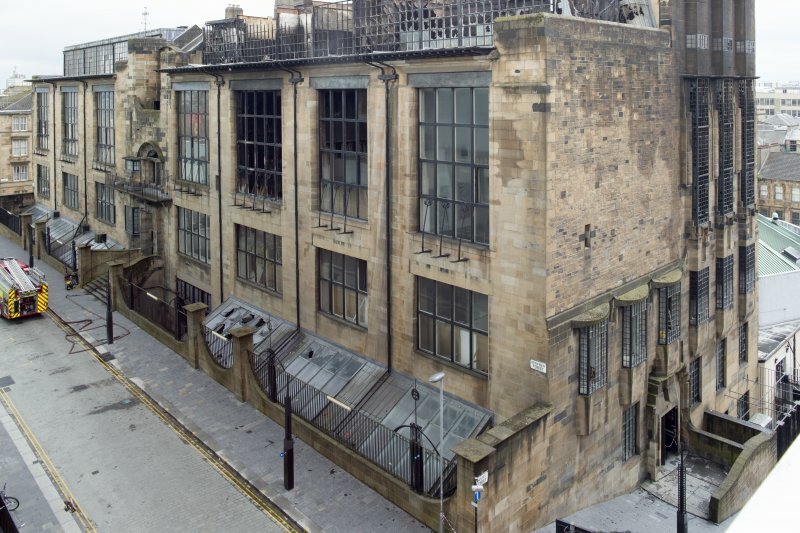 View looking south along Scott Street to the fire damaged west end of the Mackintosh building. 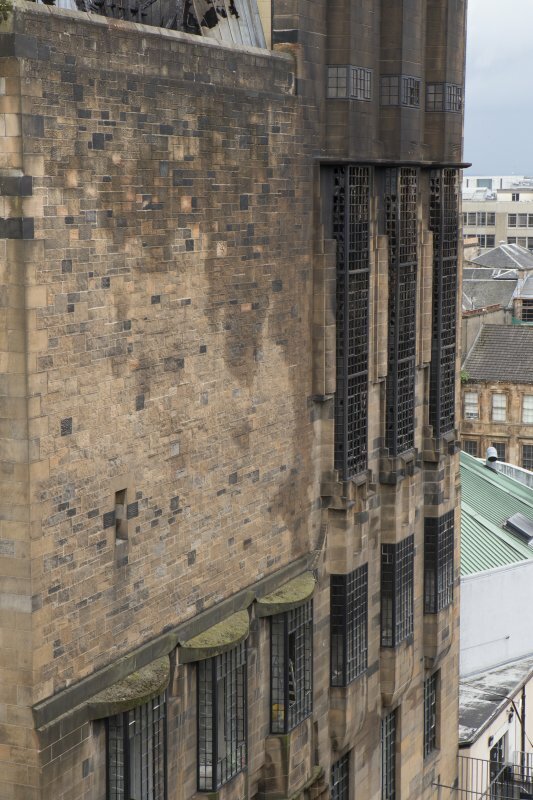 View looking down onto the central bays of the Mackintosh building from the upper levels of the Newbery Tower. 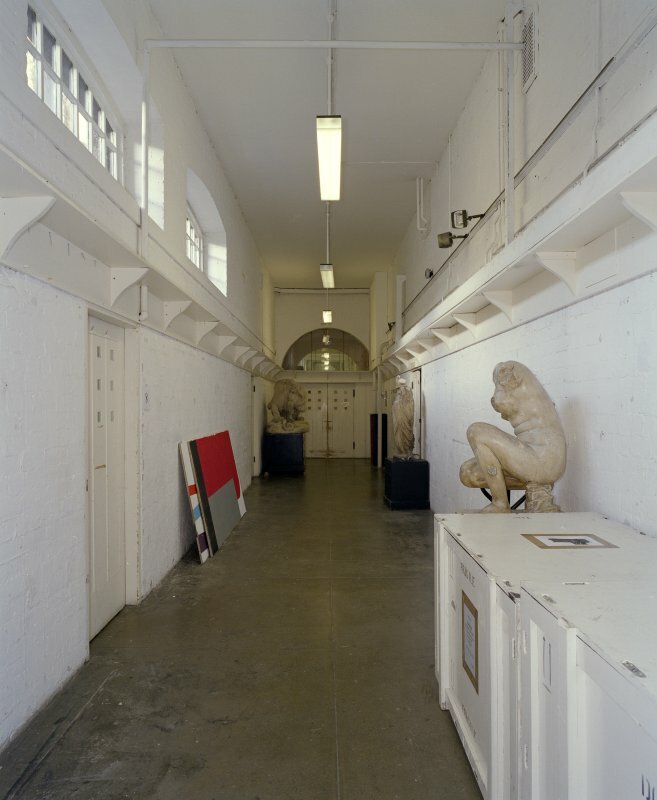 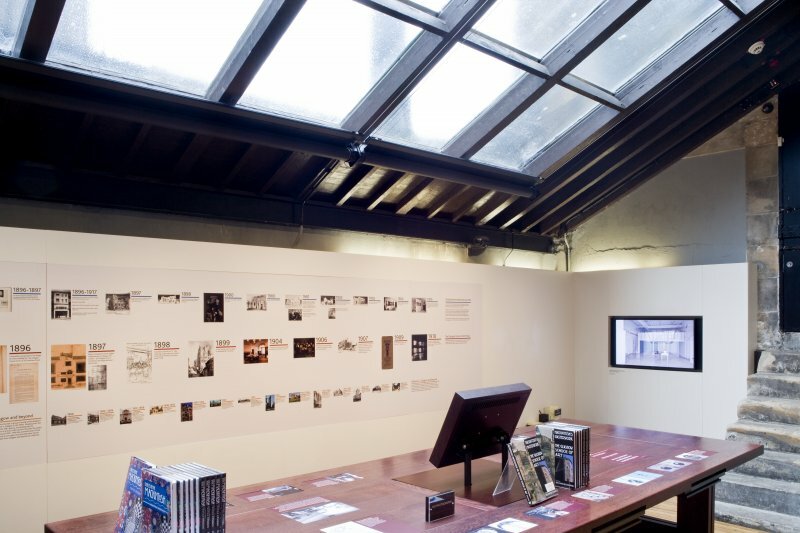 View of refurbished archive search room. 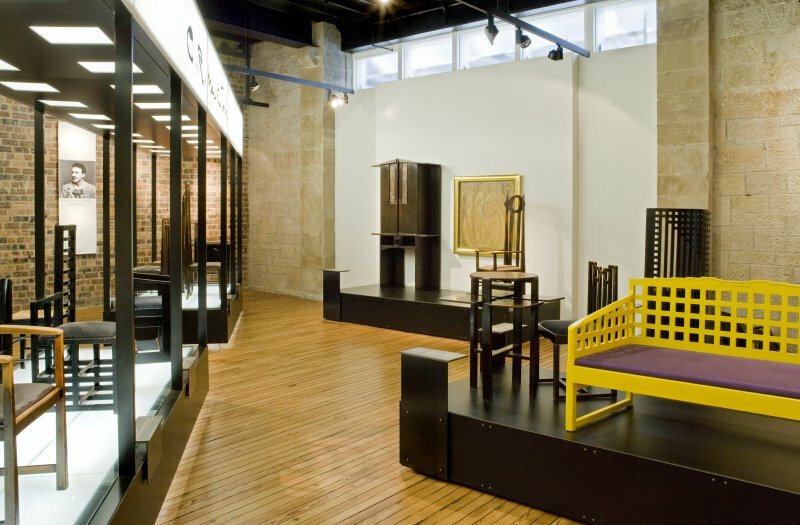 View of Mackintosh furniture exhibition area in basement of school. 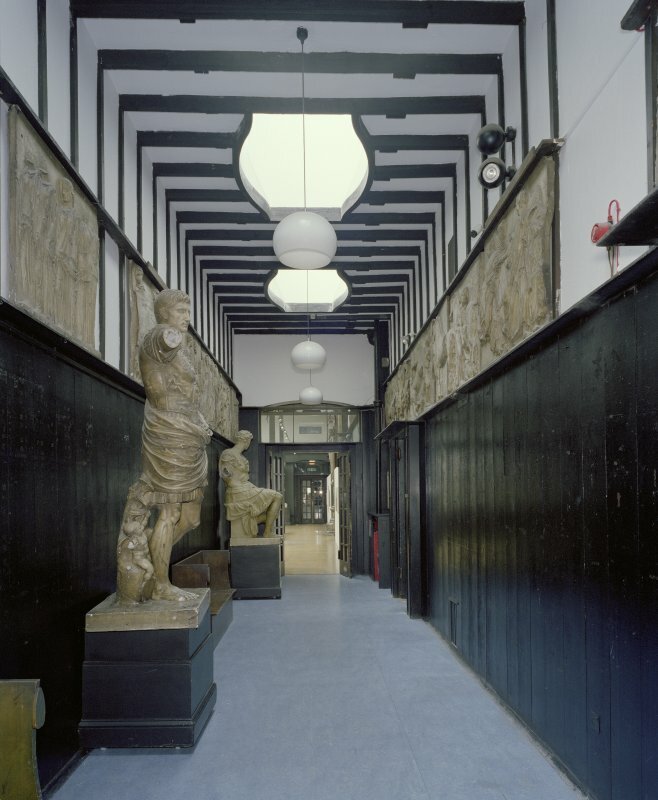 Interior, first floor, exhibition area, view from W.
Digital image of Grecian roof detail with School of Art behind. 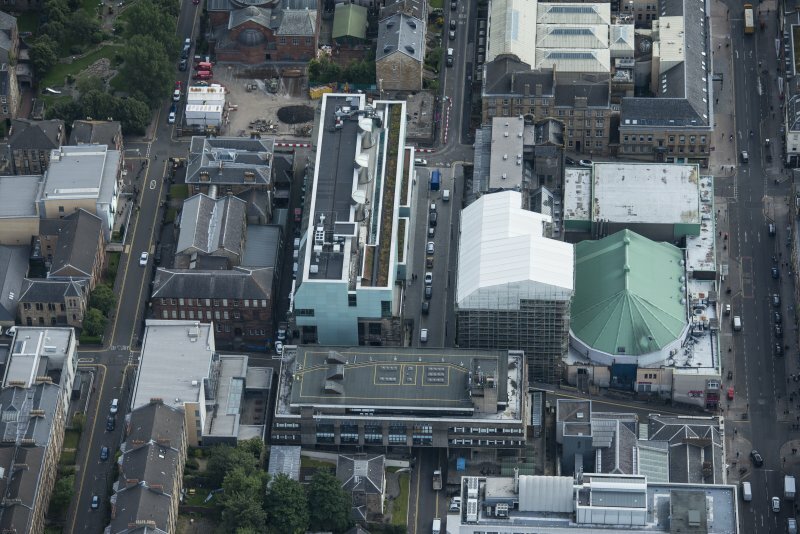 Oblique aerial view of the Glasgow School of Art and Dalhousie Street, looking ESE. 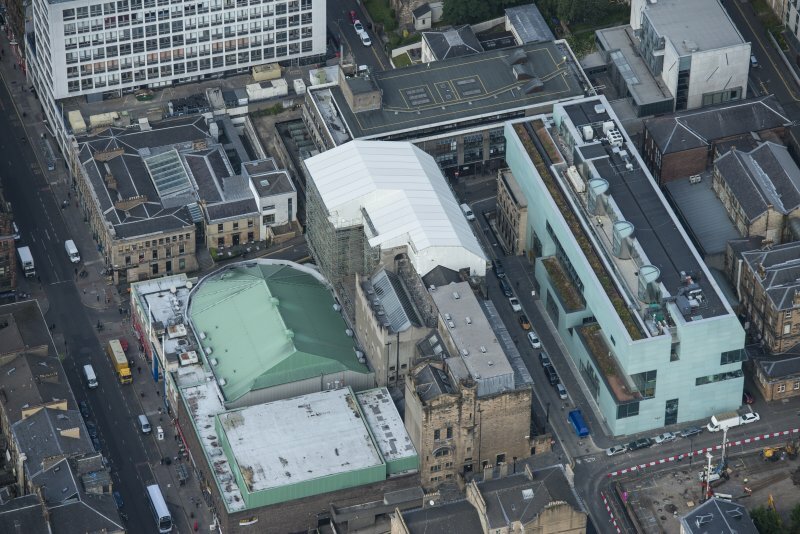 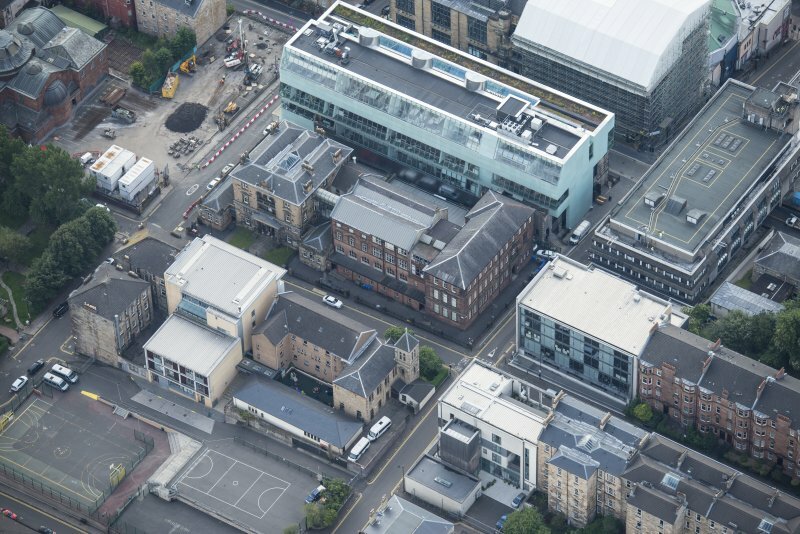 Oblique aerial view of the Glasgow School of Art and Dalhousie Street, looking S.
Oblique aerial view of the Grecian Chambers and Glasgow School of Art, looking WNW. 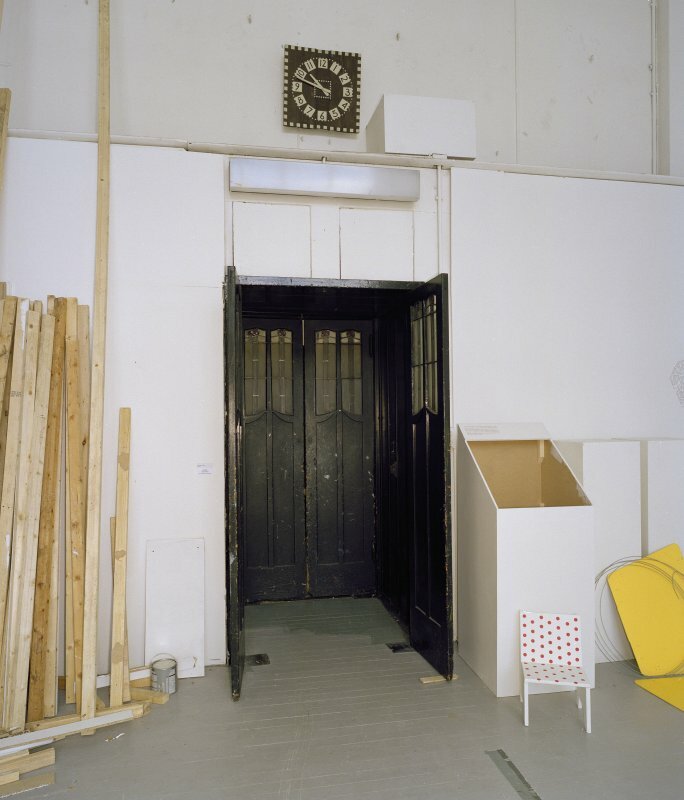 Interior view of Glasgow School of Art showing clock and chair. 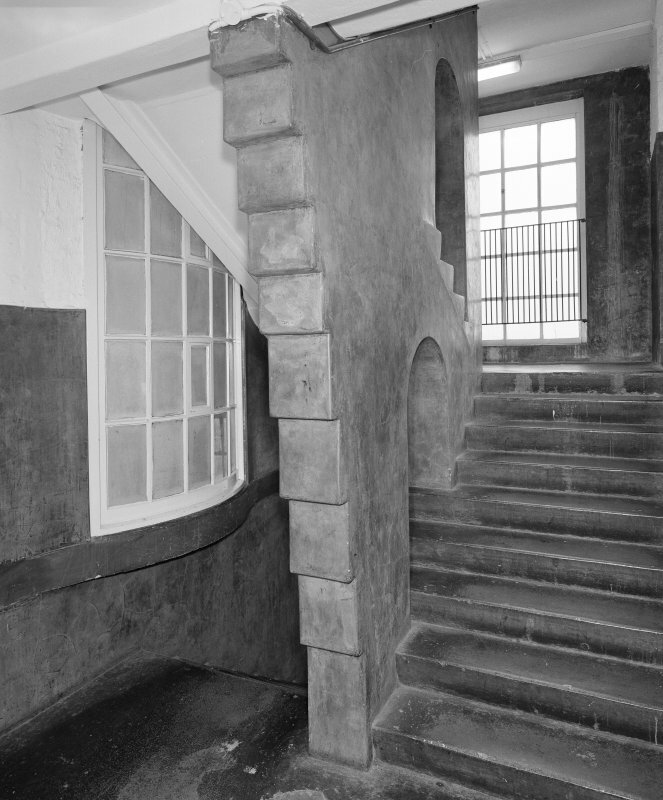 View of main doorway at N facade of Glasgow School of Art from N.
Interior view of Glasgow School of Art showing E corridor on first floor from E.
Interior view of Glasgow School of Art showing second floor W landing from N.
Interior view of Glasgow School of Art showing basement lecture theatre from N.
Interior view of Glasgow School of Art showing basement fan room with detail of heating system fan. 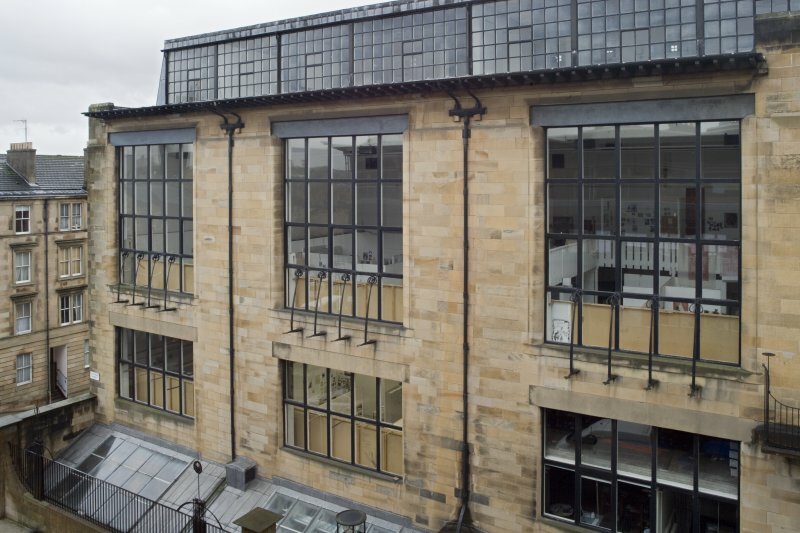 View of W facade of Glasgow School of Art from NW. 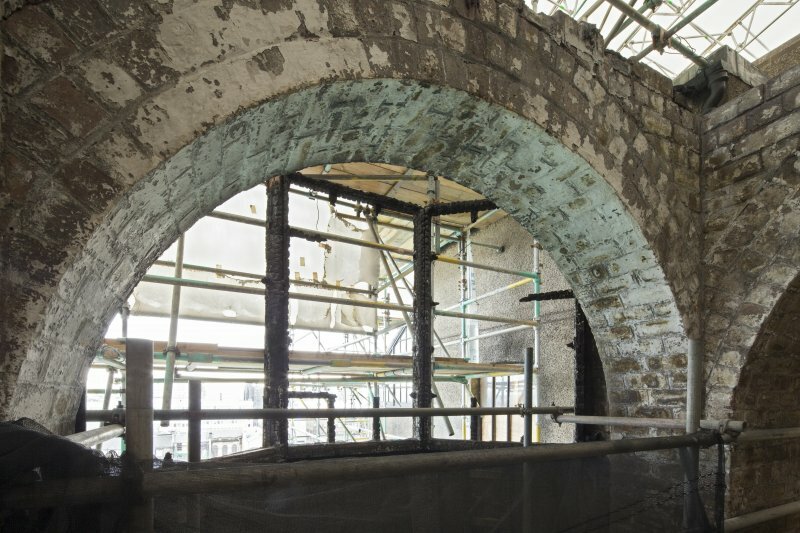 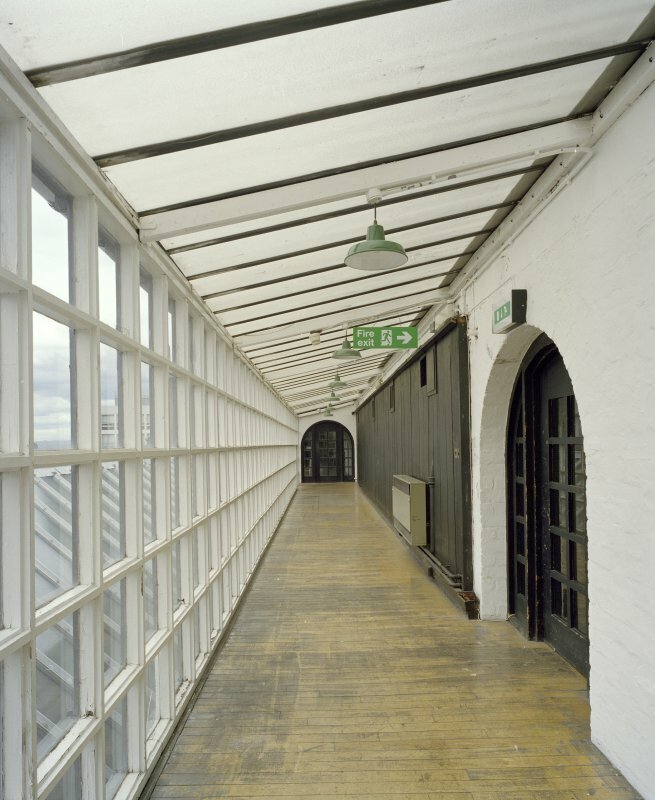 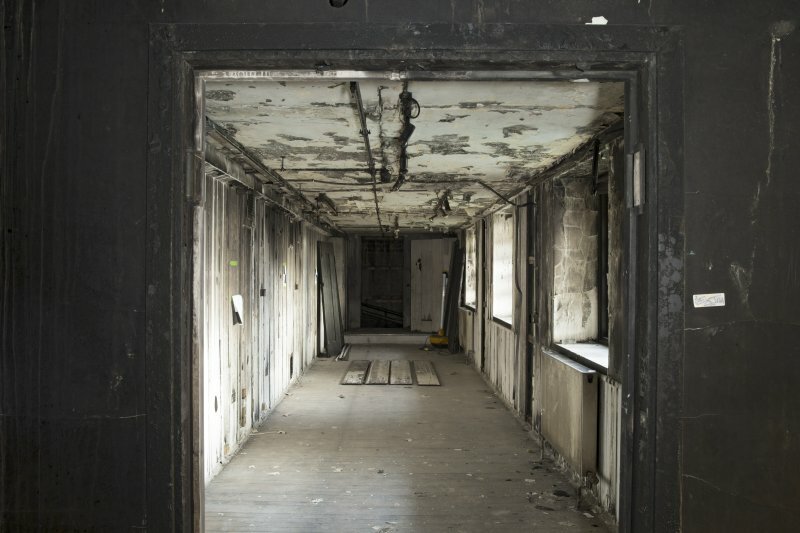 Interior view looking along the fire damaged loggia and hen run at second floor level of the Mackintosh building. 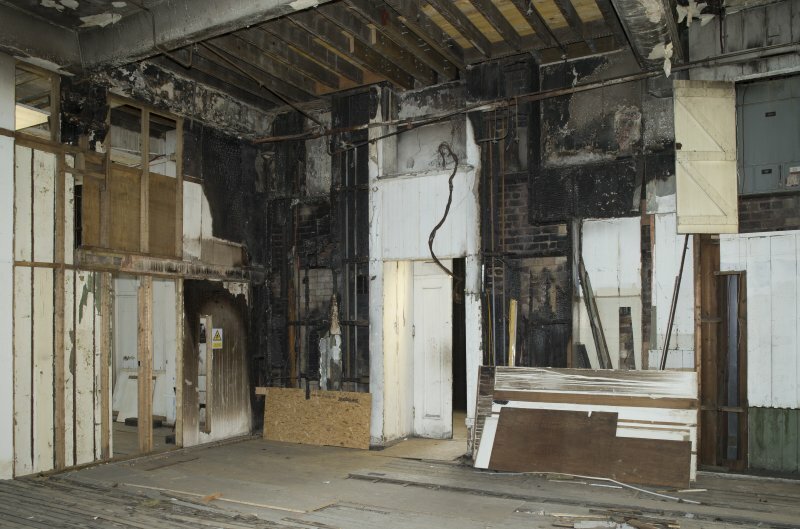 Detail view of the fire damaged second floor studio adjacent to the entrance bay of the Mackintosh buiding, taken from the west. 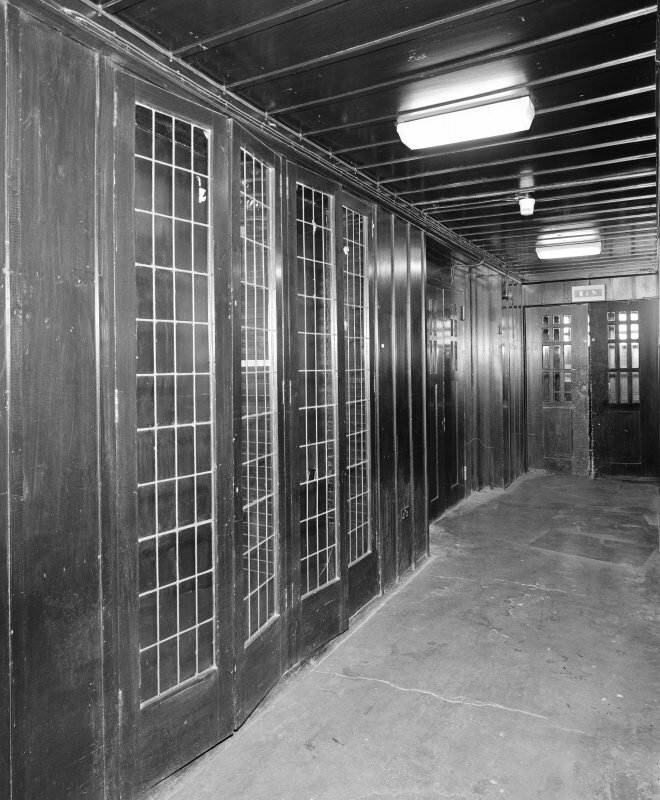 Interior view of a fire damaged door screen facing onto the west stair of the Mackintosh building. 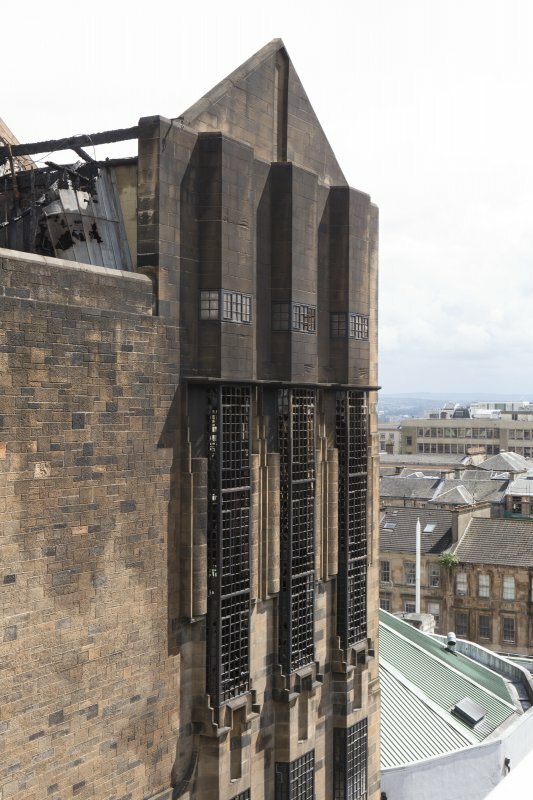 View of the fire damaged west end of the Mackintosh Building, taken from the north-west on the roof of the Bourdon building. 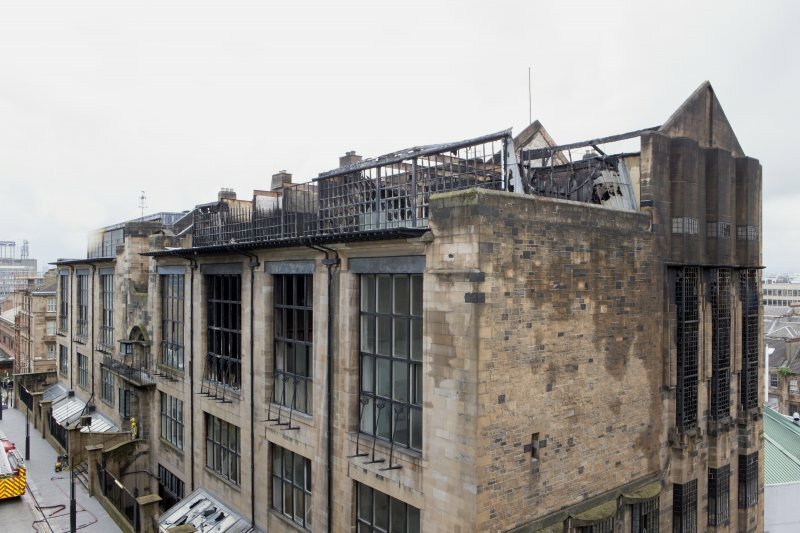 View of the fire damaged first and second floors of the Mackintosh building's west end, taken from the roof of the Bourdon building. 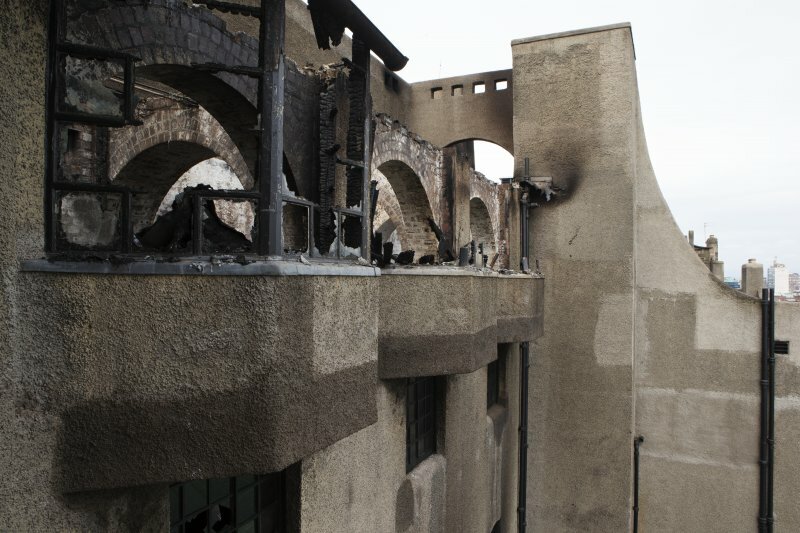 View looking along the fire damaged loggia bay windows on the south elevation of the Mackintosh building. 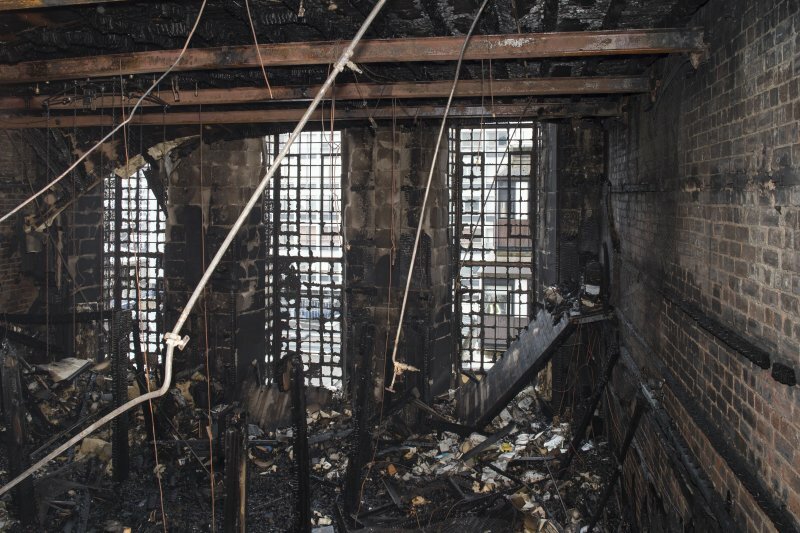 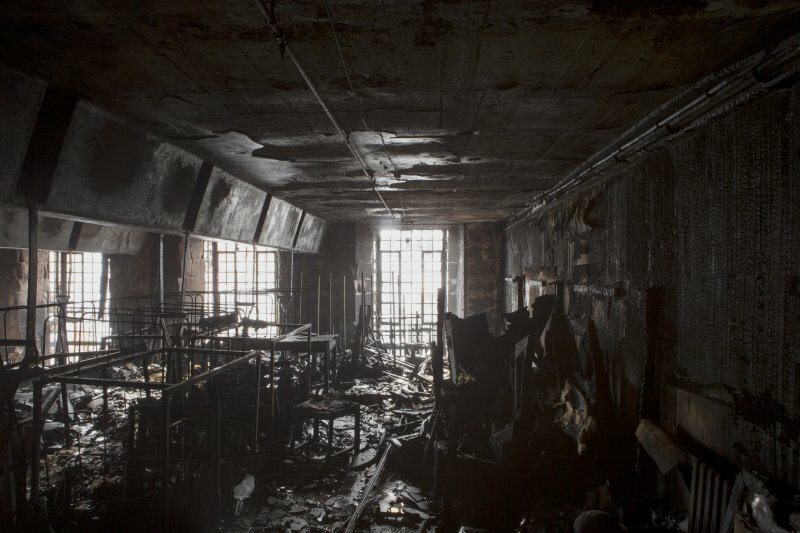 Interior view looking into the fire damaged library of the Mackintosh building. 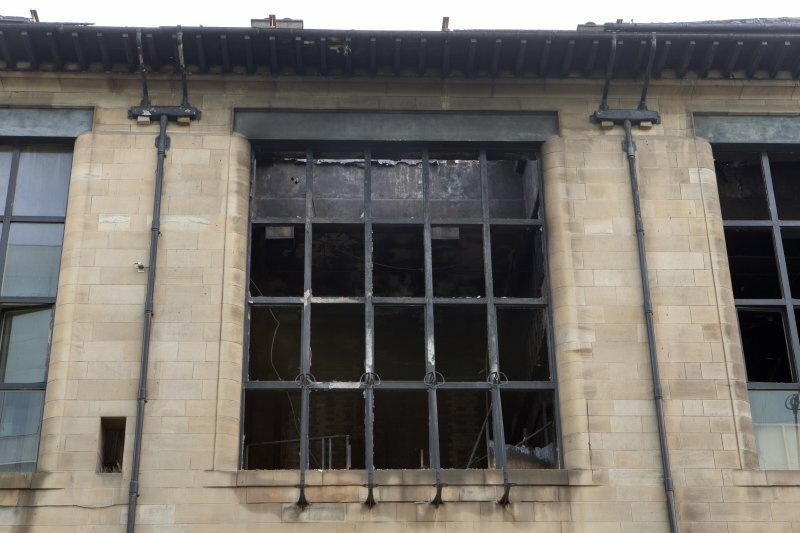 View of the fire damaged first floor studio window in the 6th bay, taken from the north. 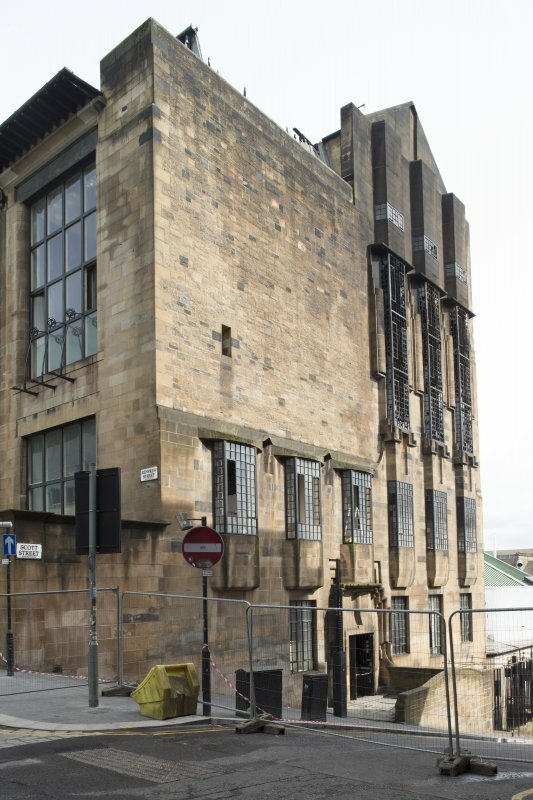 View looking east along the fire damaged north elevation of the Mackintosh building. 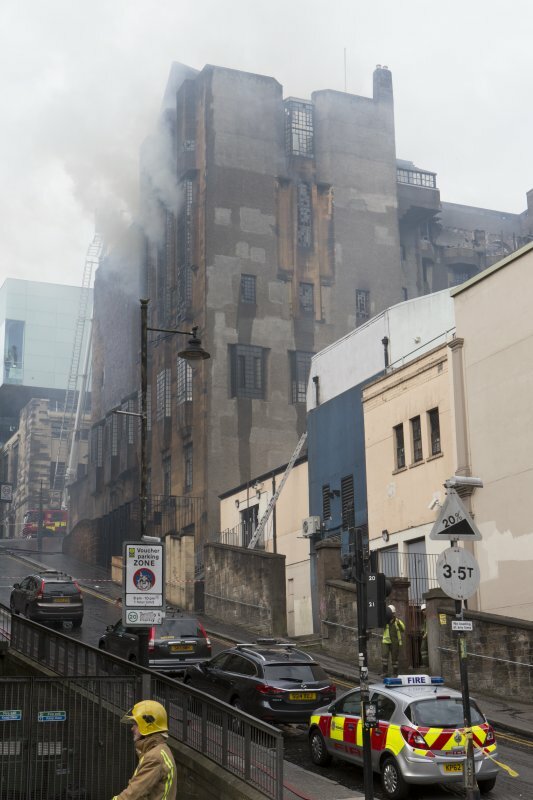 View looking up to the fire damaged south wall of the Mackintosh building. 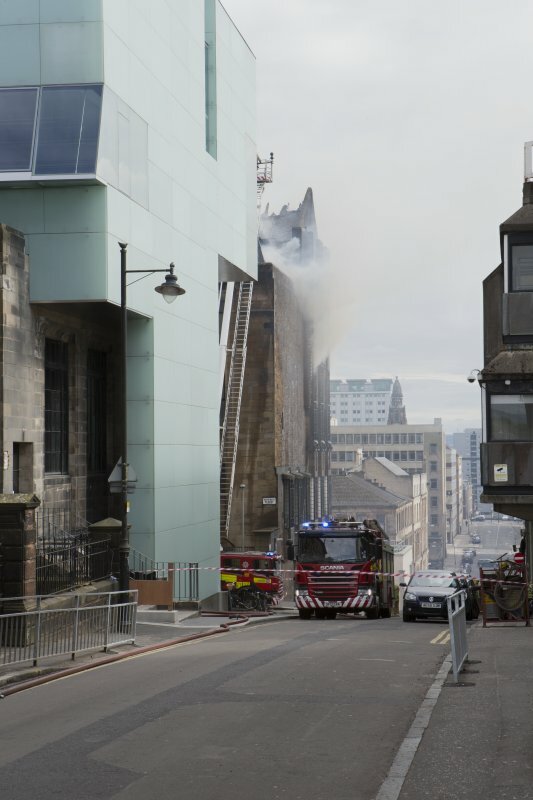 View looking up Scott Street showing the fire brigade tackling the fire in the Mackintosh building. 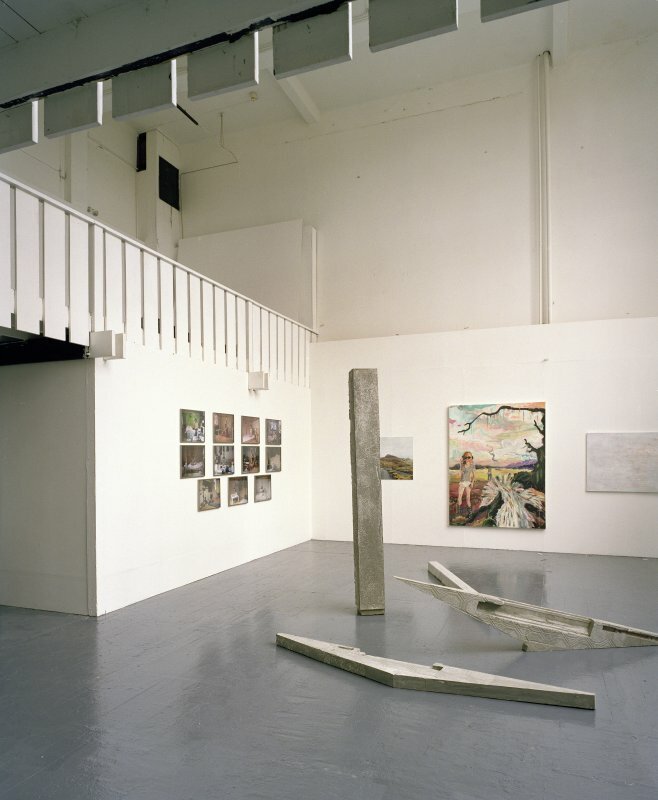 View of exhibition area within basement. 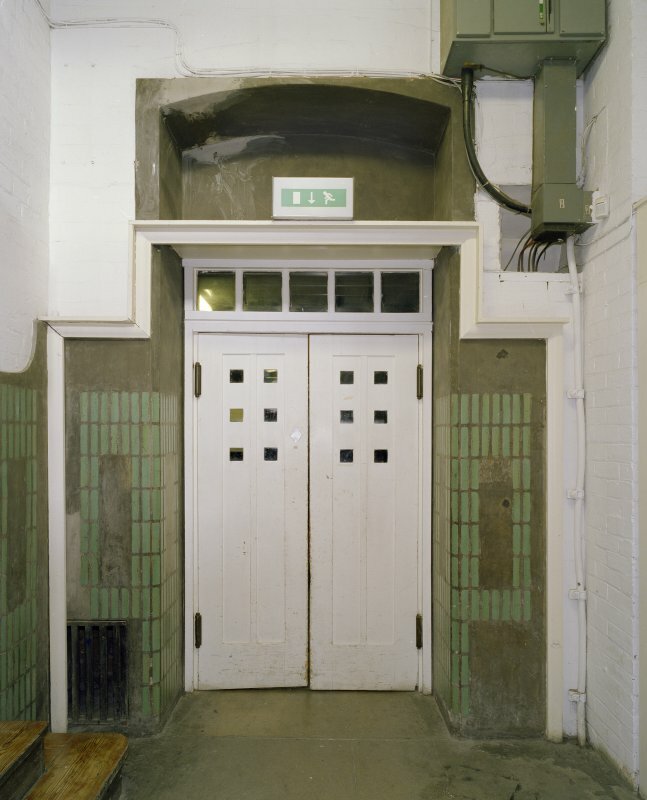 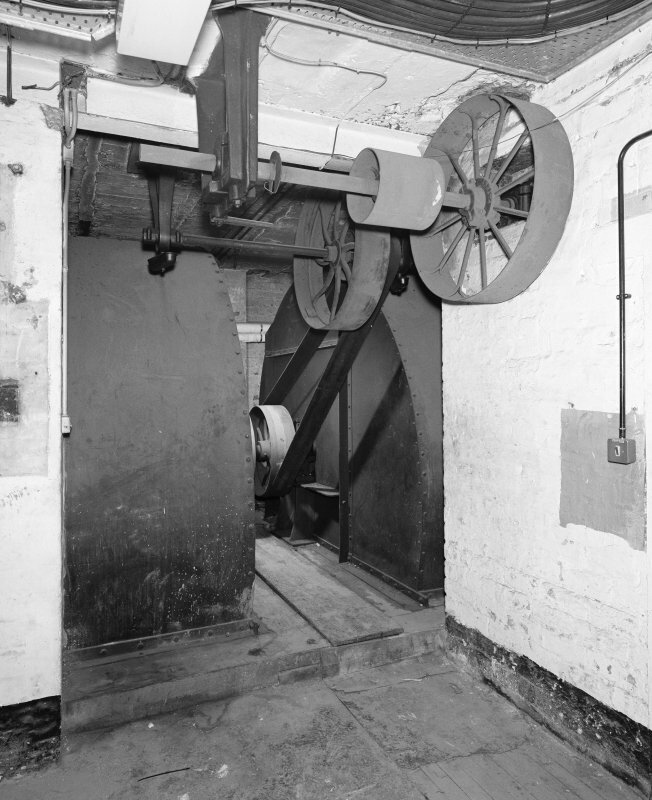 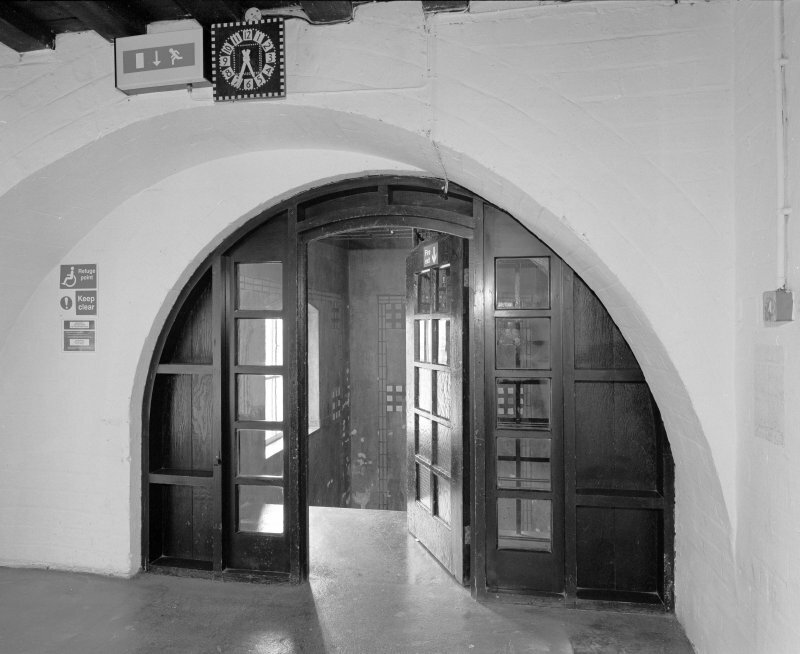 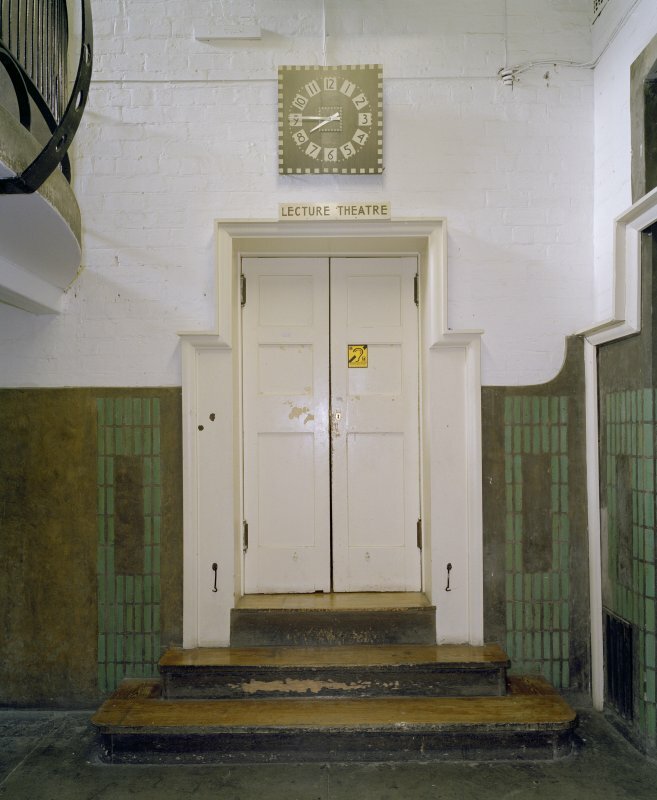 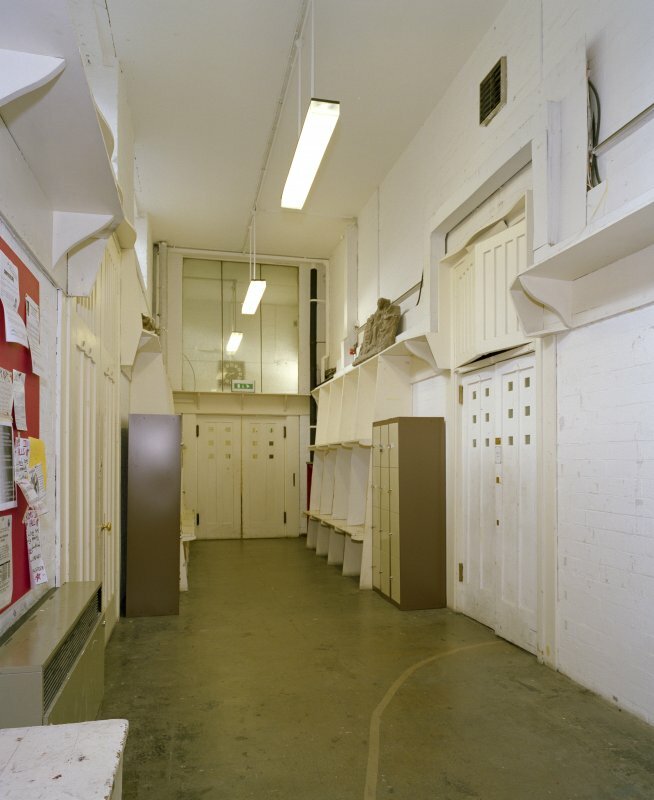 View of door leading from Dalhousie Street/Renfrew Street junction into basement, now within exhibition area. 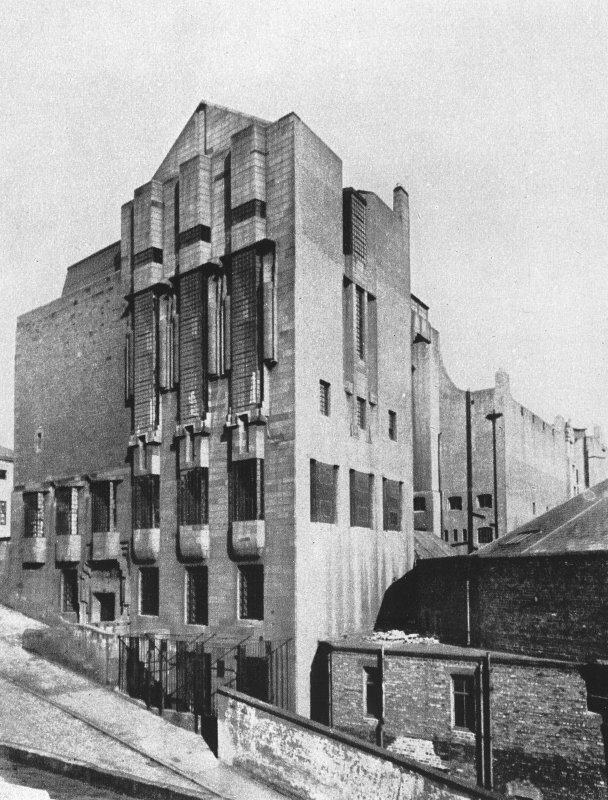 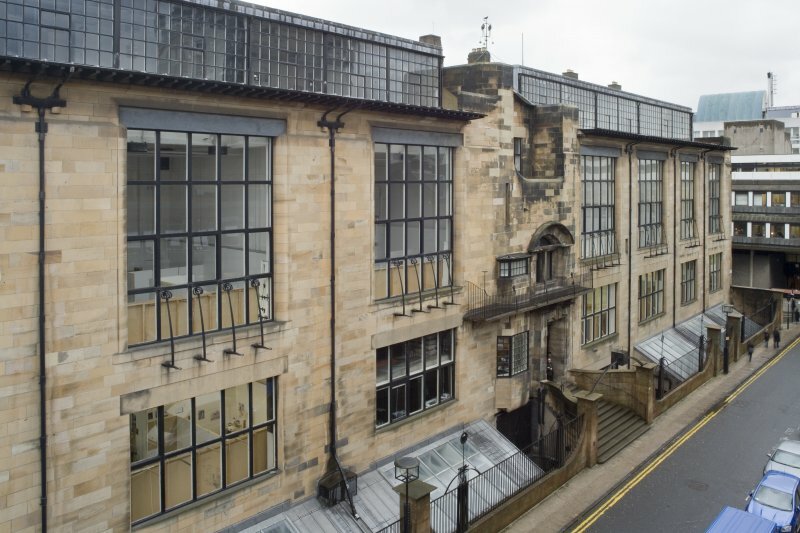 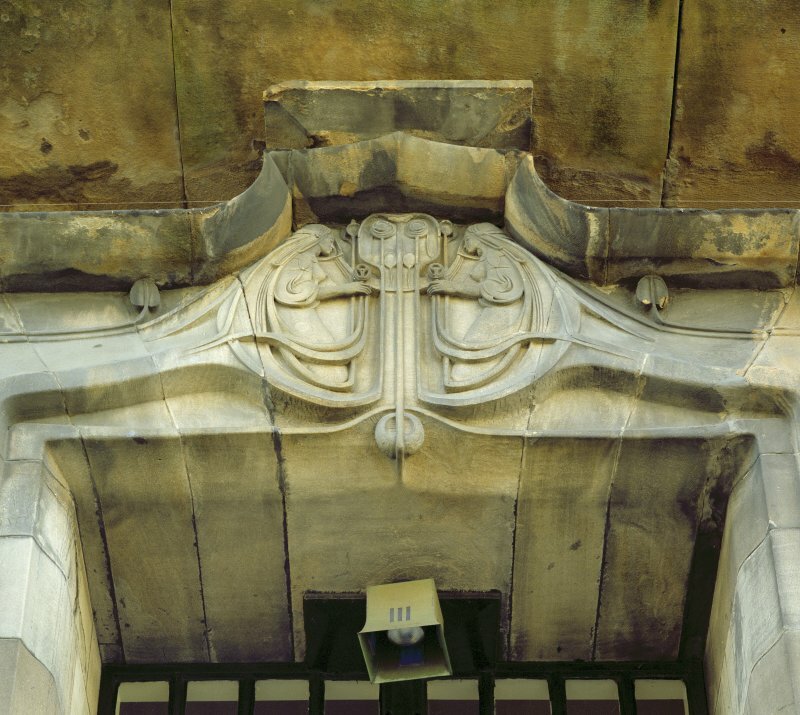 In 1897 Charles Rennie Mackintosh won the commission to design the Glasgow School of Art, whilst working for the architectural firm of Honeyman and Keppie. 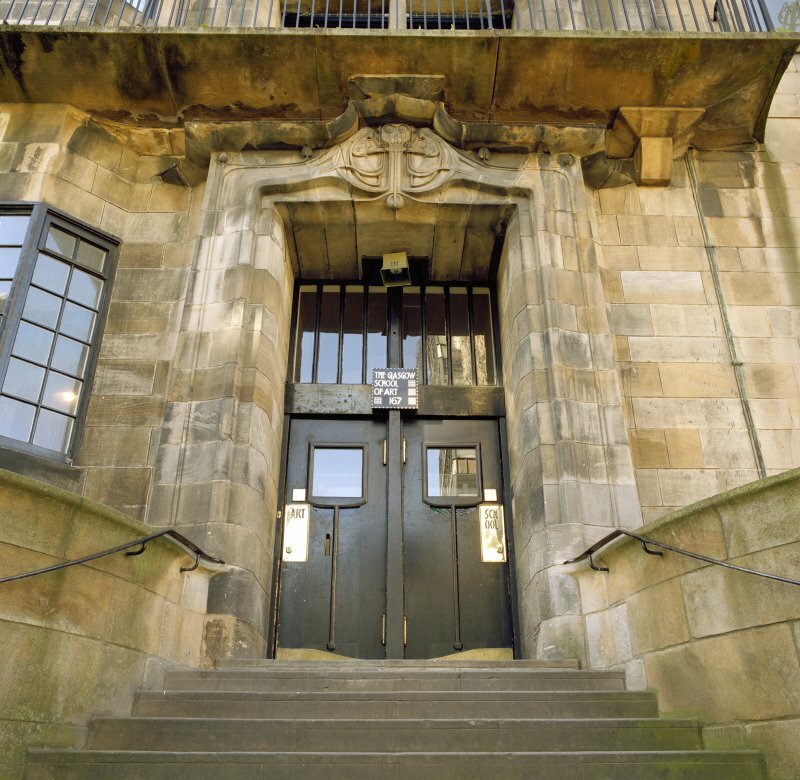 In 1899 the first phase opened (from Dalhousie Street to the entrance block), and construction of the second phase took place in 1907-9. 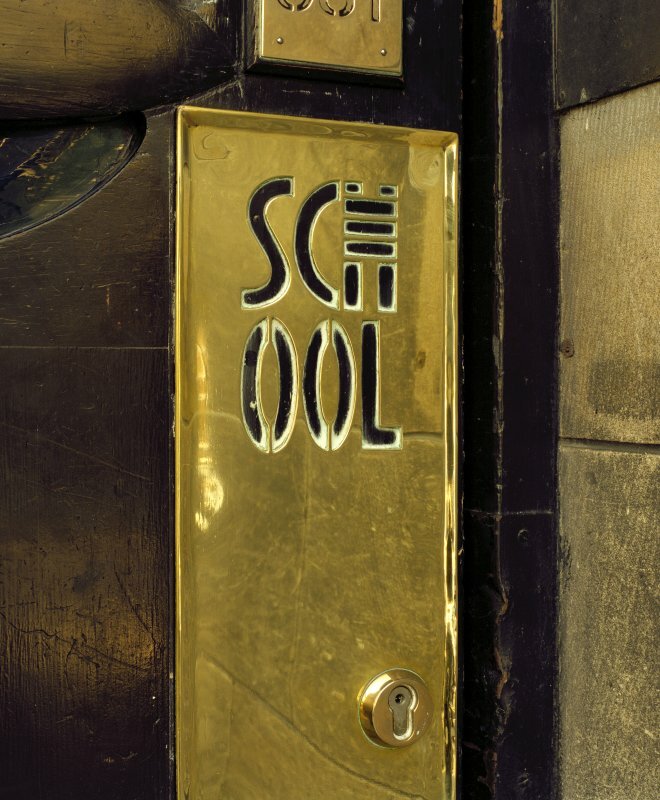 The School is recognised as one of Mackintosh's masterpieces. 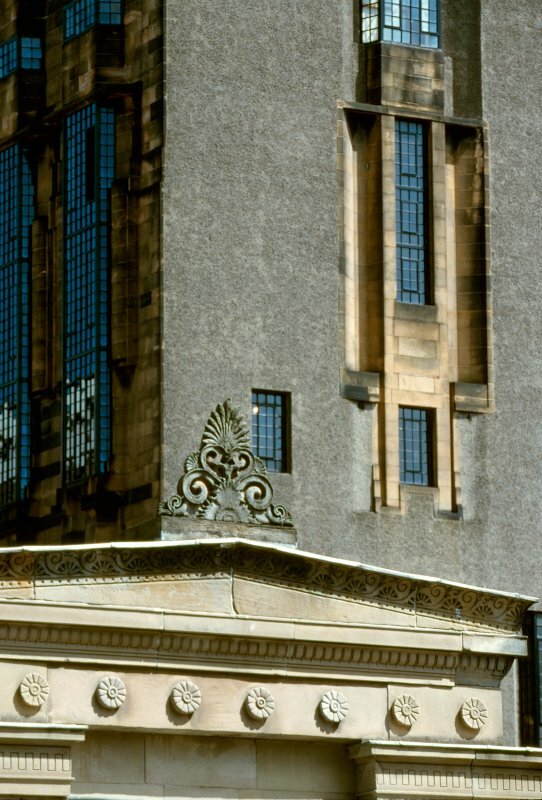 The exterior references a Scottish tower-house at the east gable, while a panel above the entrance is in Art Nouveau style. 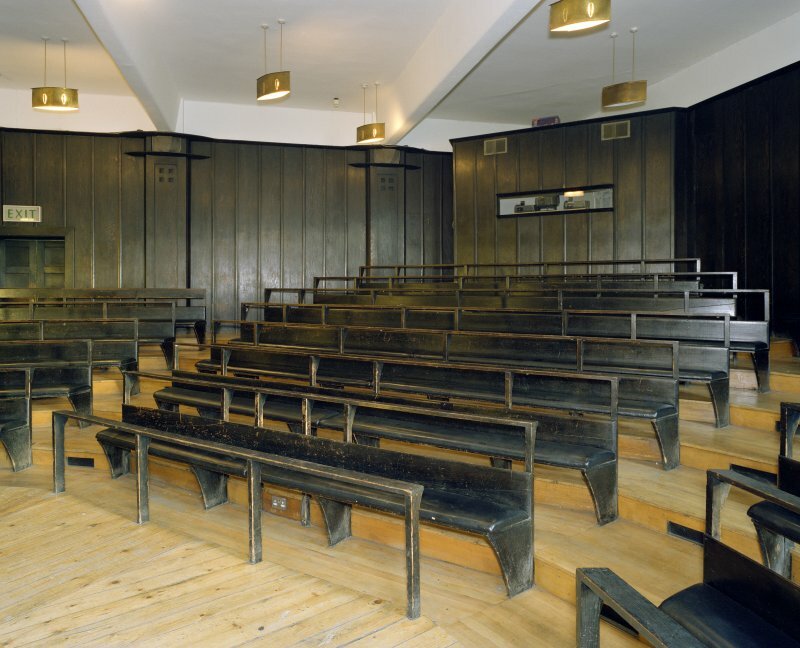 Inside the building, the principles of the Arts and Crafts movement are discernable, particularly in the details of timber and metalwork throughout the School. 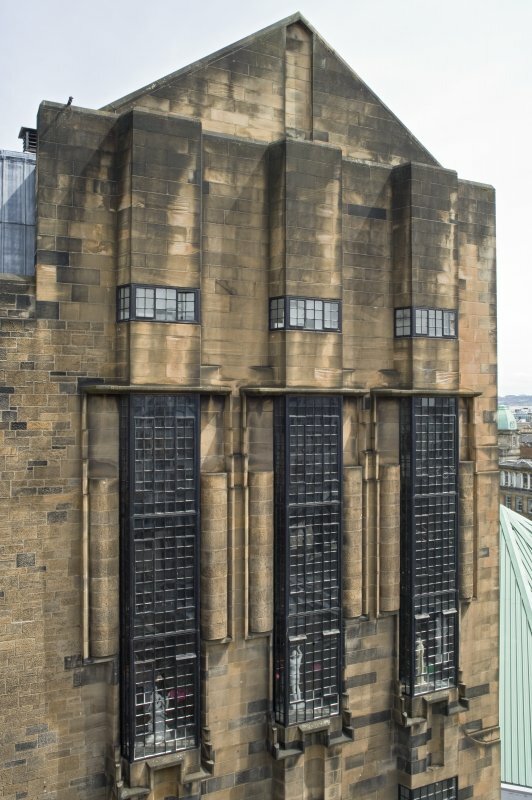 In 1897 Charles Rennie Mackintosh won the commission to design the Glasgow School of Art, whilst working for the architectural firm of Honeyman and Keppie. 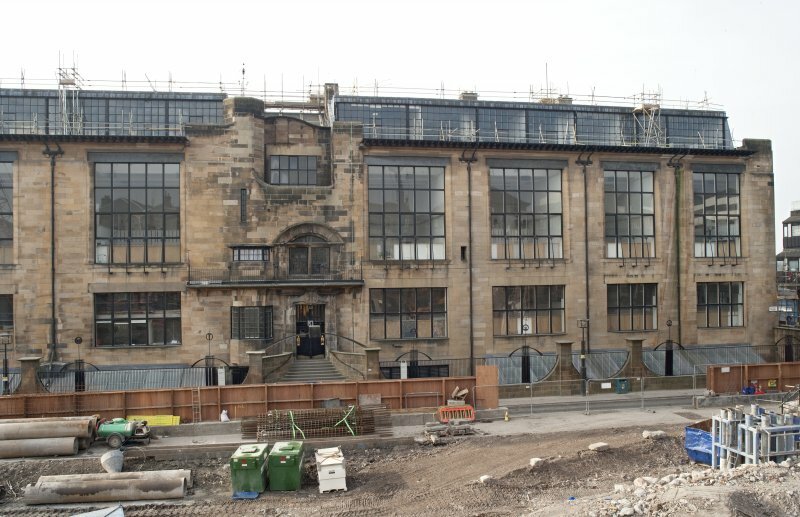 The first phase of construction. 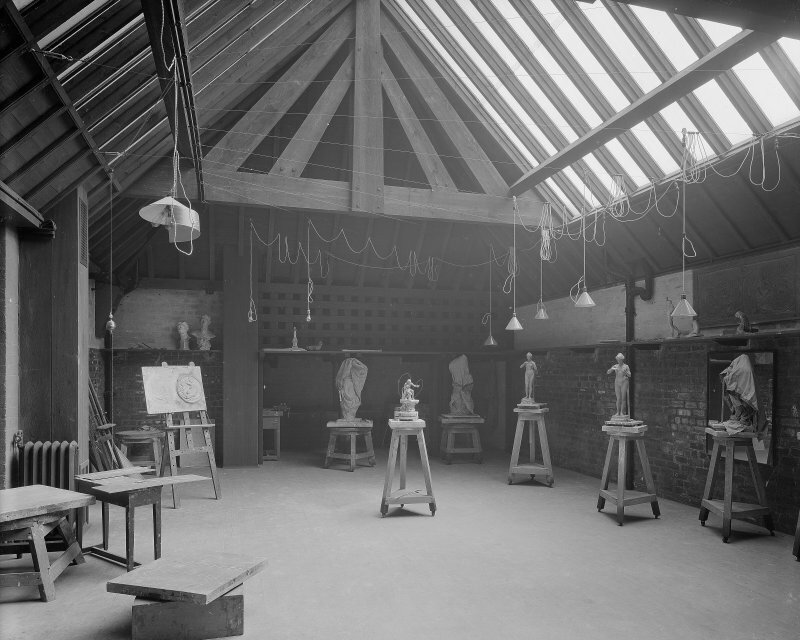 Photographs by Eric de Maré. 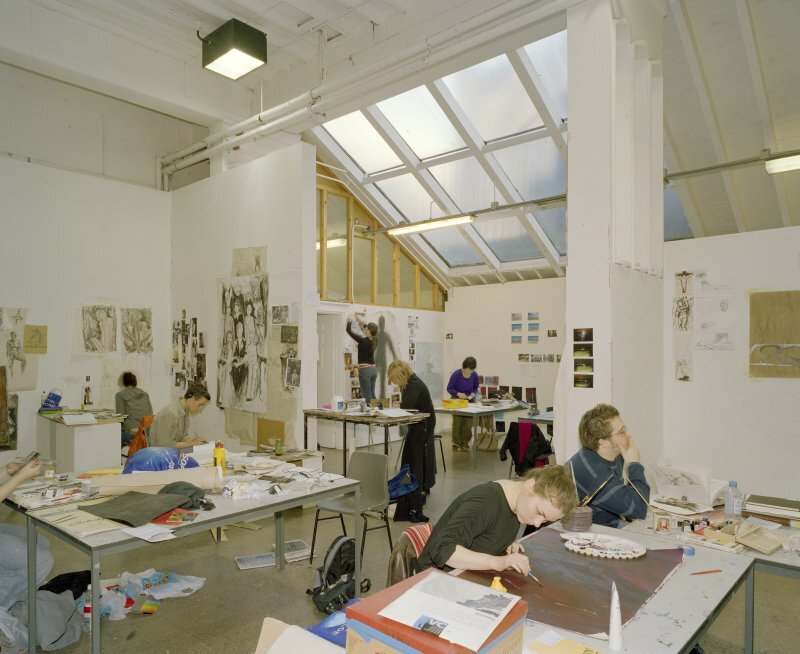 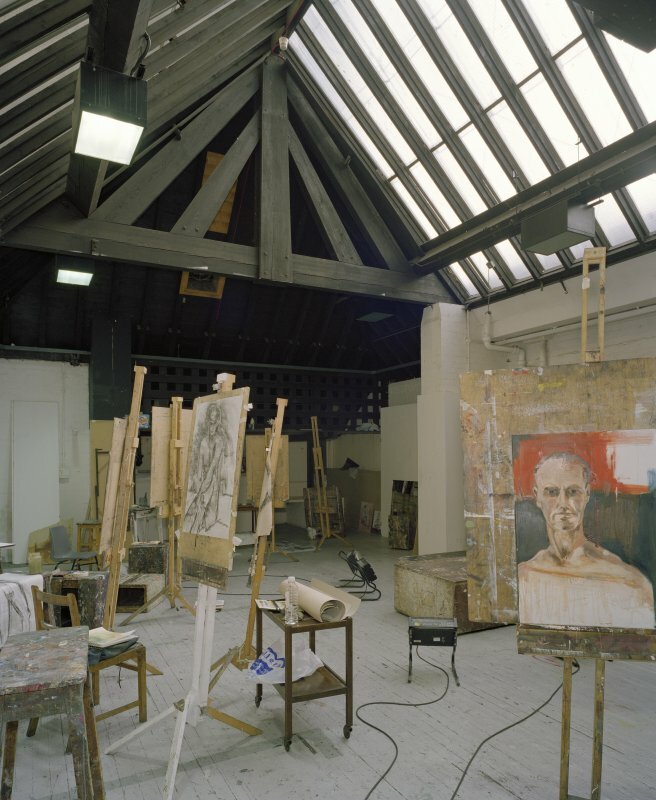 A series of survey visits were made to Glasgow School of Art in 2010 and 2011. 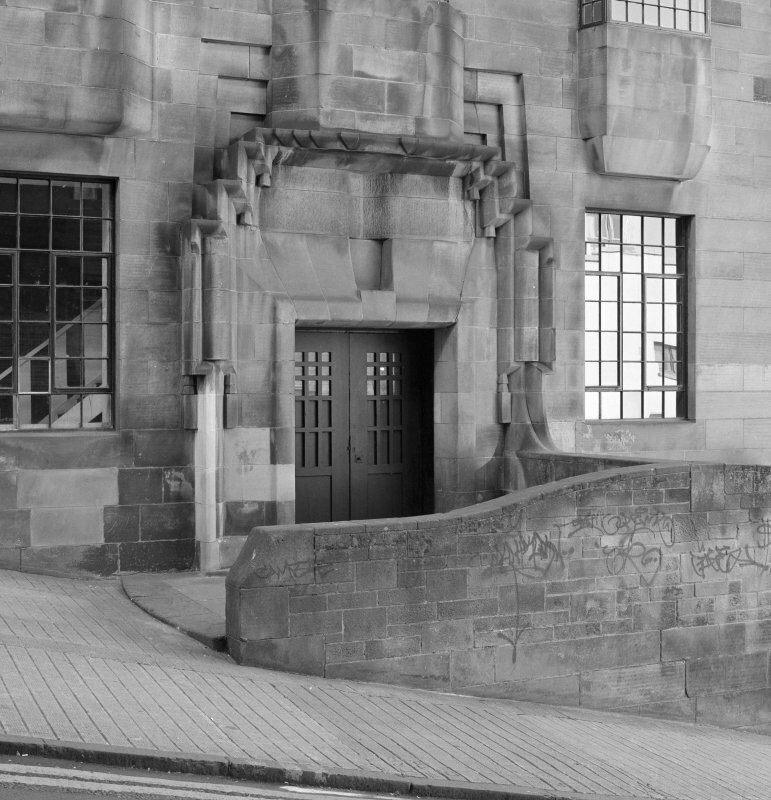 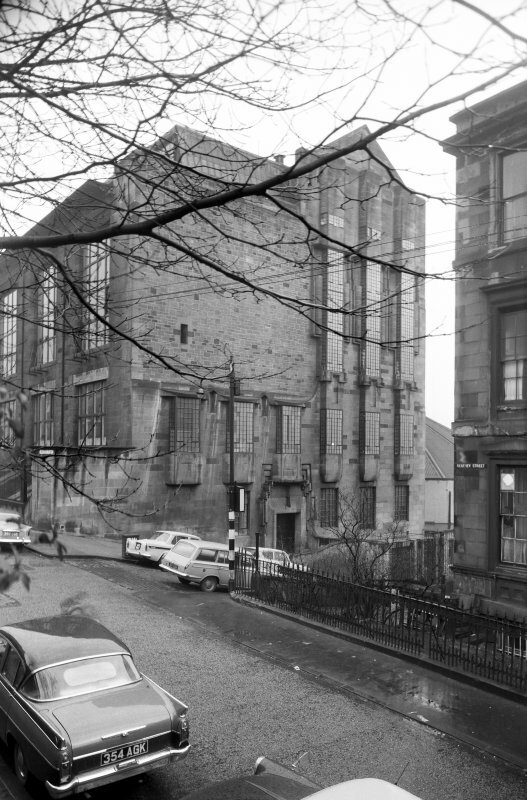 These were primarily to record the Newbery Tower and Foulis Building prior to their demolition, but records were also made of the recently altered exhibition, archive and shop areas in the basement of the Mackintosh Building and the Student Union building. 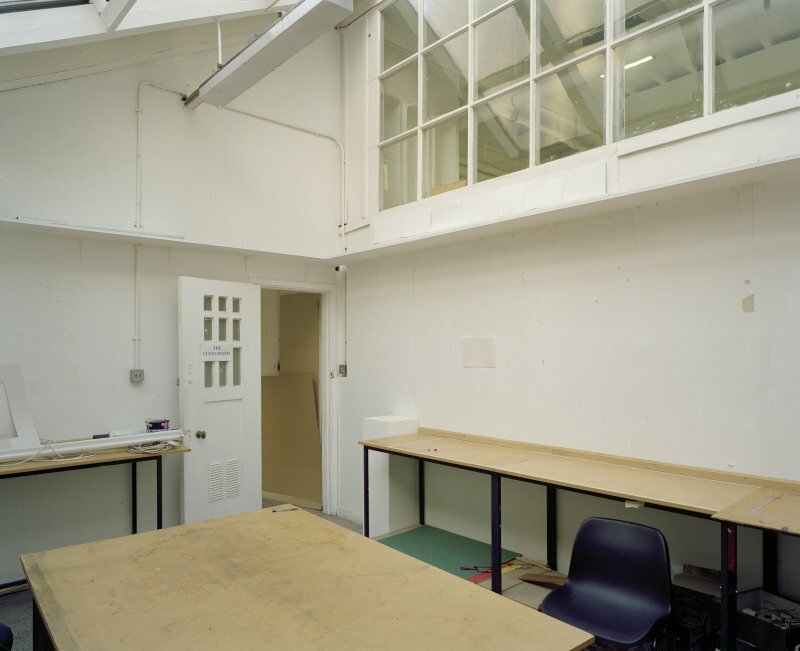 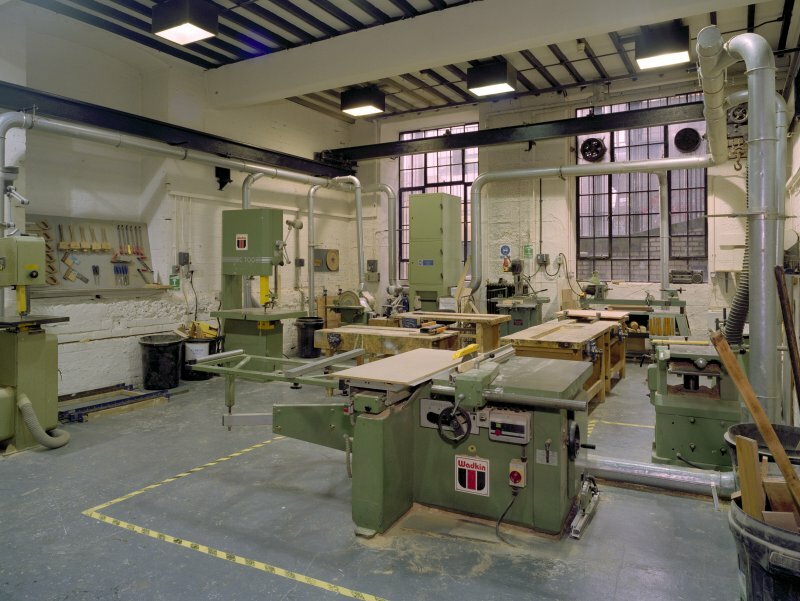 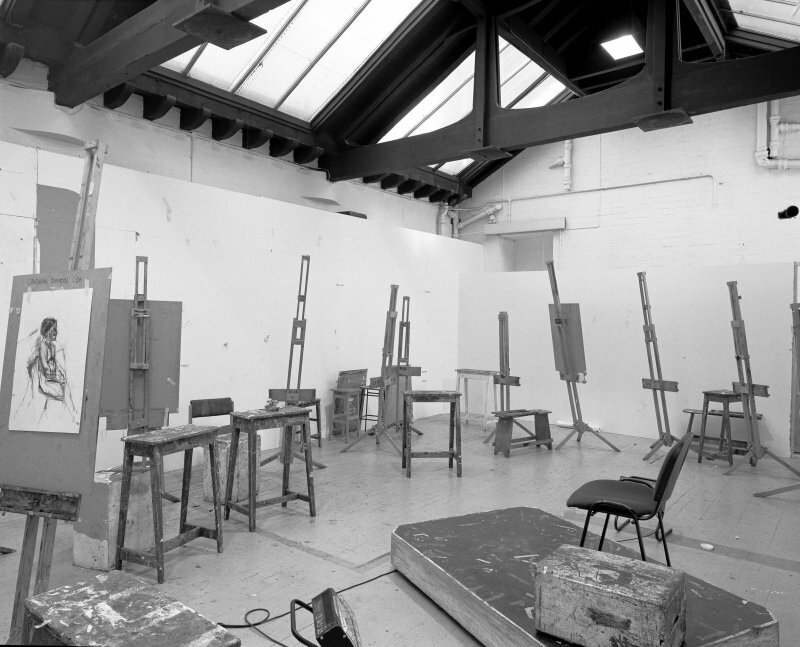 The first phase of this survey work, in November 2010 and May 2011, recorded the buildings in use as studios, whilst the second phase, in June 2011, show the buildings in use during the school's degree show. 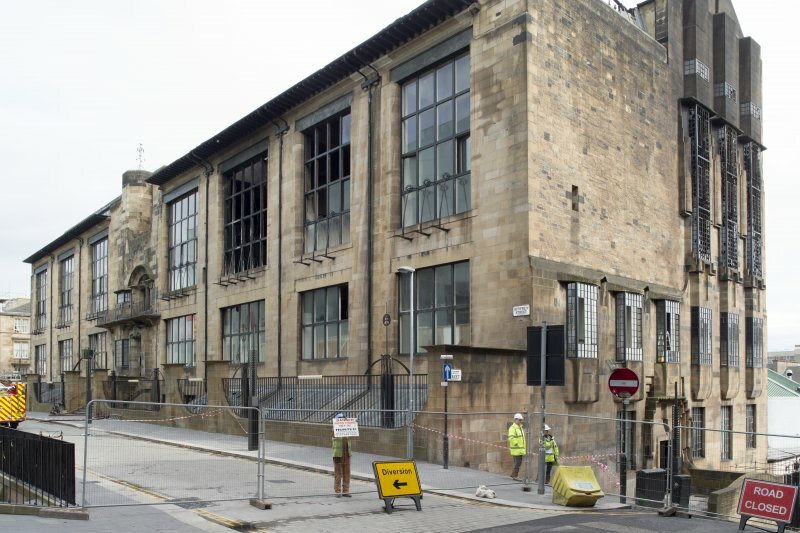 NS 5843 6597 Following a major fire which affected much of the western half of the Glasgow School of Art, a programme of archaeological excavation, salvage and standing building recording was undertaken in the Mackintosh Library, the worst affected area. 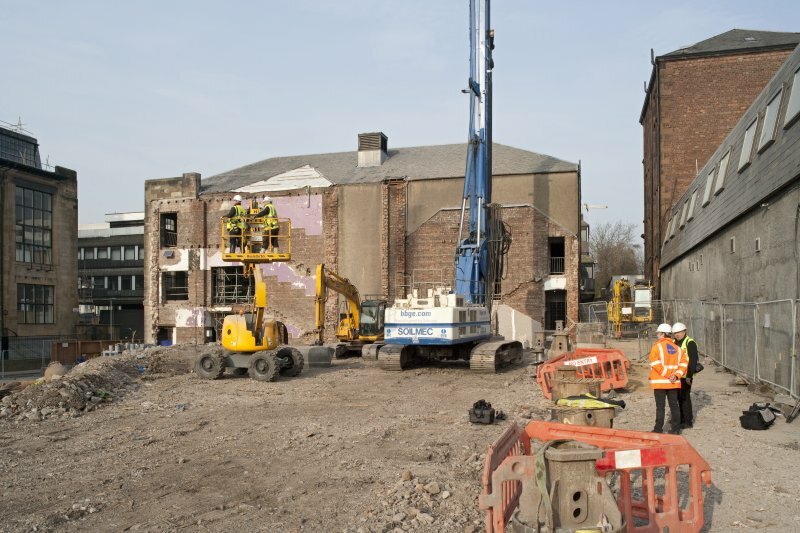 The work was carried out from 17 November 2014 to 6 February 2015. 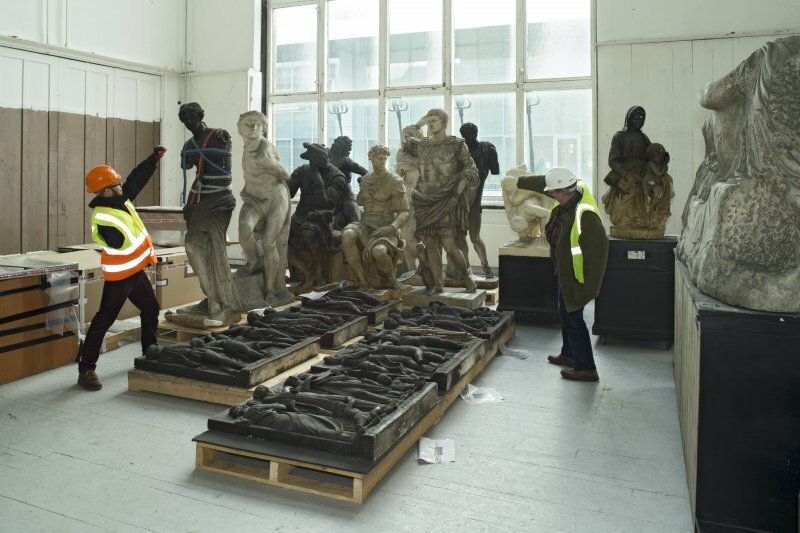 On-site specialist treatment of the artefactual assemblage was provided by AOC Archaeology Group. 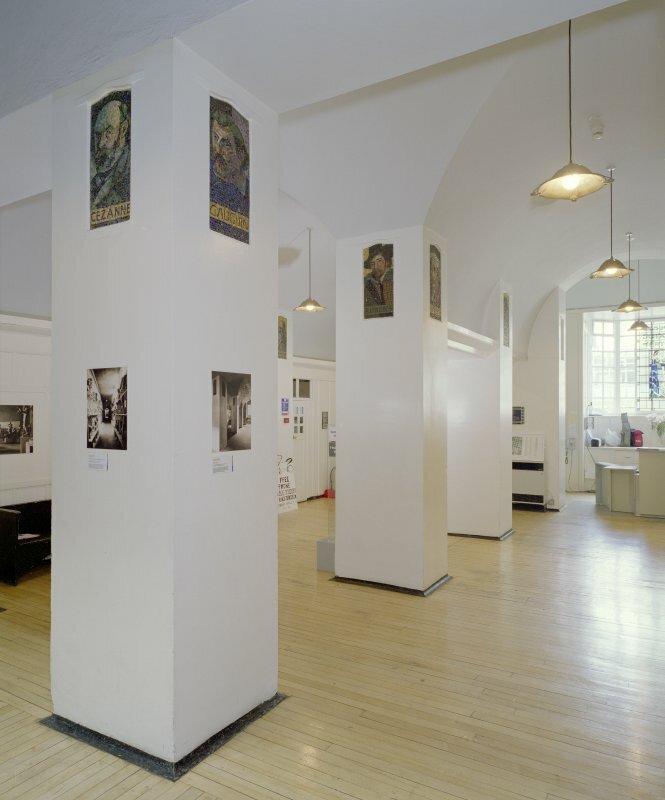 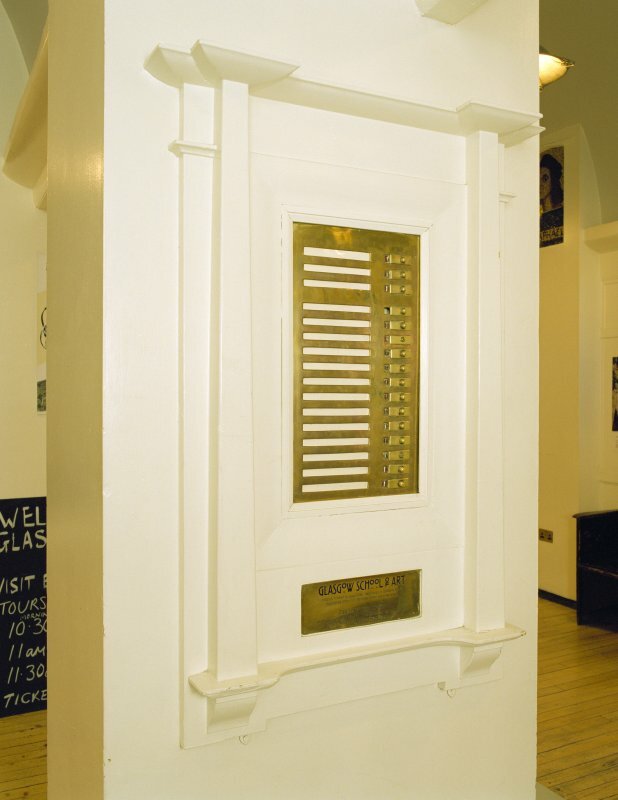 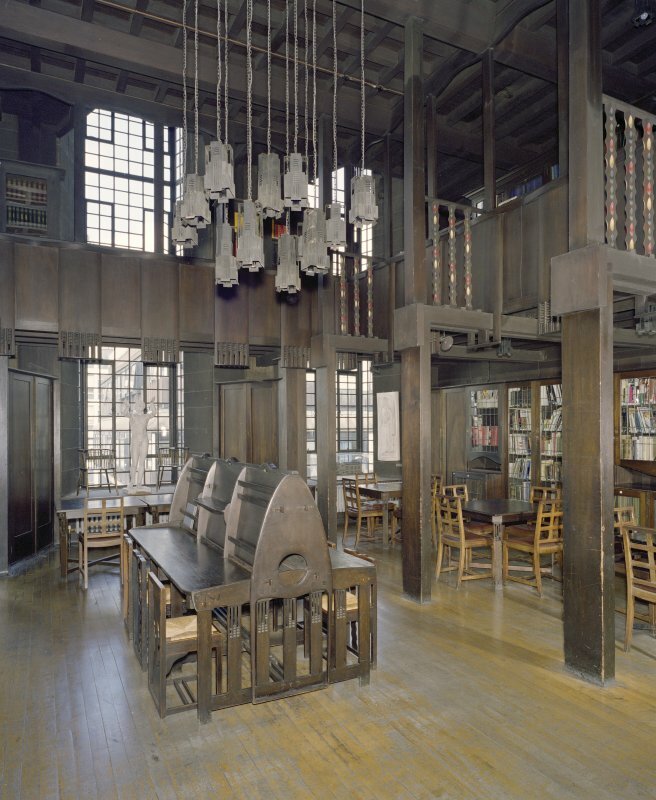 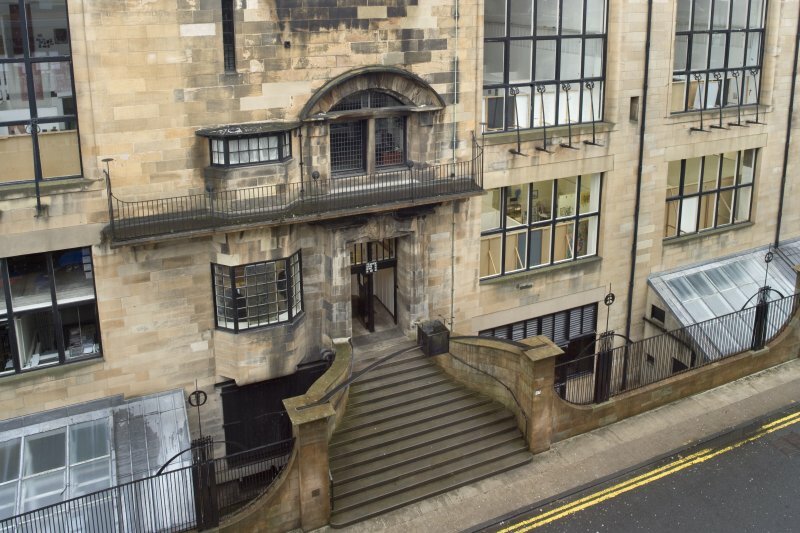 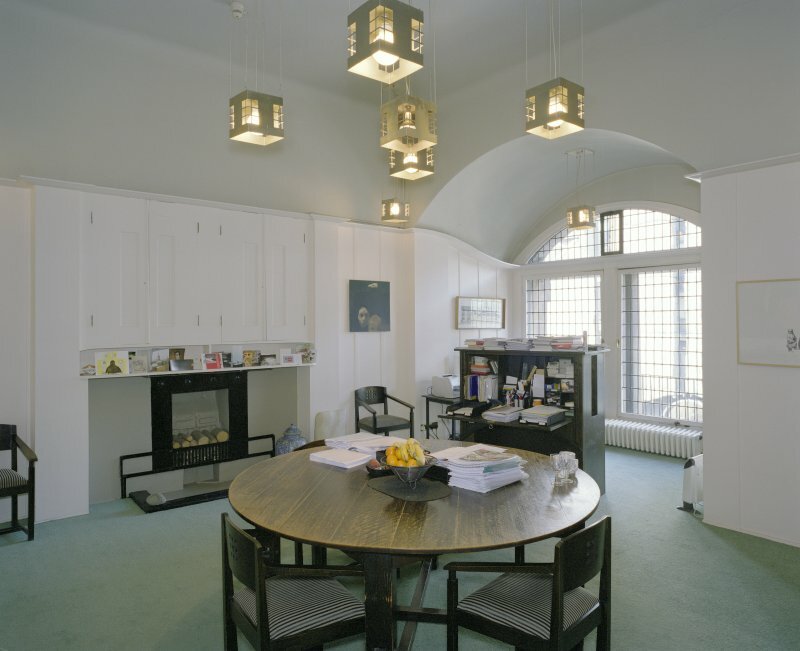 The Mackintosh Library was built between 1907 and 1909, and is located at first floor level, at the western end of the corridor leading from the museum, at the top of the main access stair. 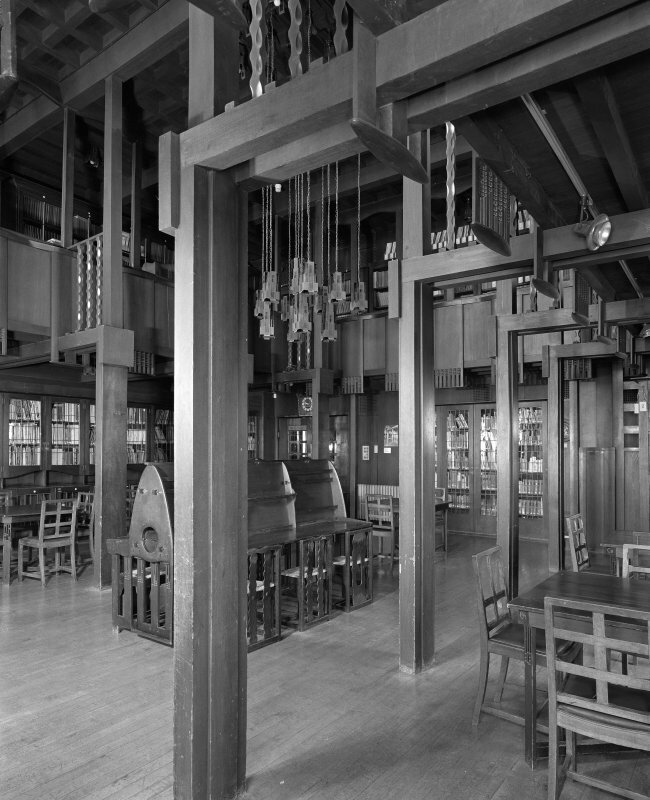 As well as notable items of furniture, important books and periodicals, the library featured elaborate structural timberwork and associated fittings. 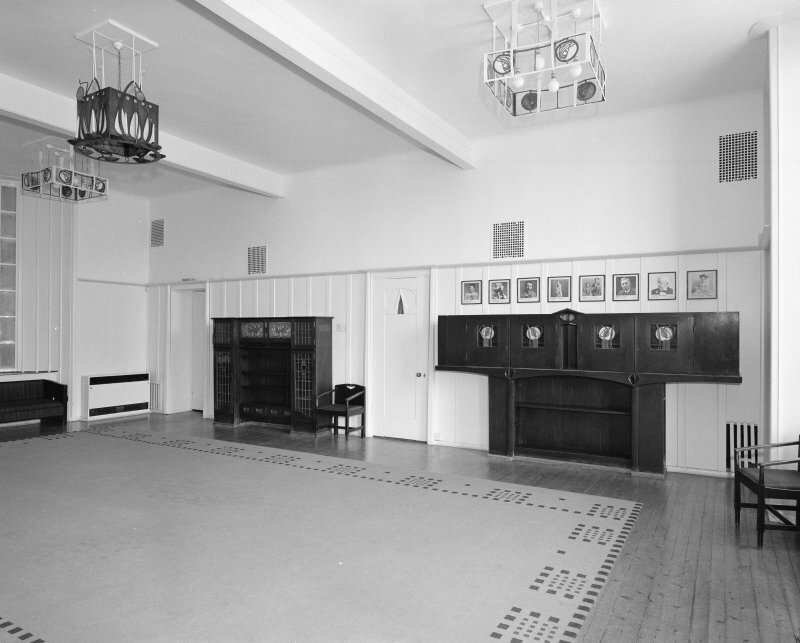 The floor was covered by a large debris pile, roughly 10 x 10m in plan, of loose and fused material up to 2.0m deep, containing burnt and/or water-damaged books, periodicals, furniture, structural timberwork, metal fittings, and other structural debris – primarily stonework, plasterboard and plaster. 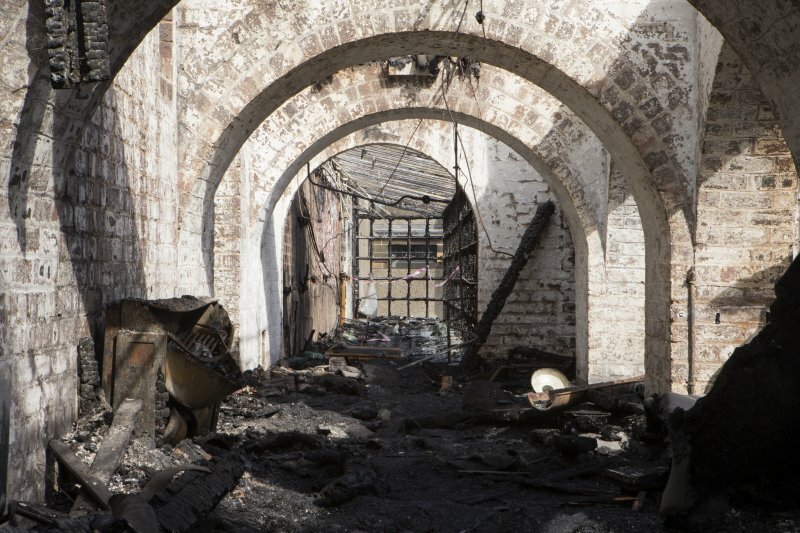 Further fire-damaged material remained in situ, including a number of timber posts, most of the floorboards, cabinet bases, some steps, patches of plasterwork, and elements of the services (notably electrical wiring and heating duct apertures). 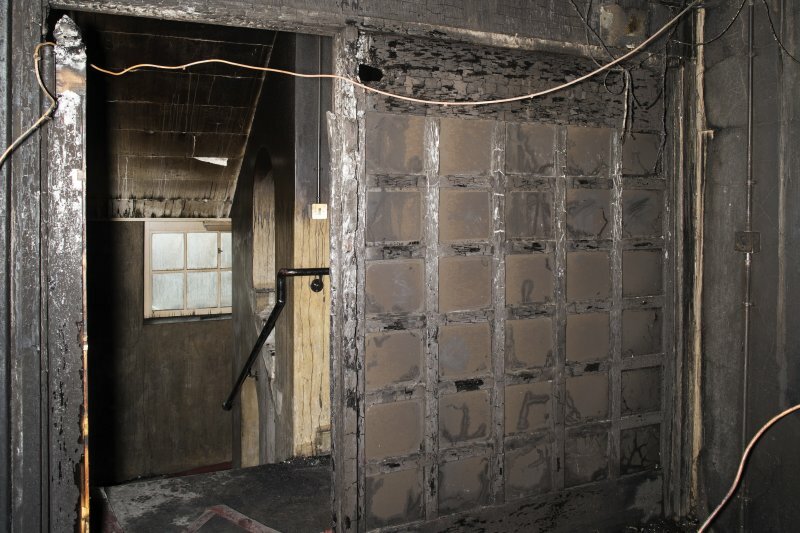 The ceiling was significantly damaged and partially collapsed. 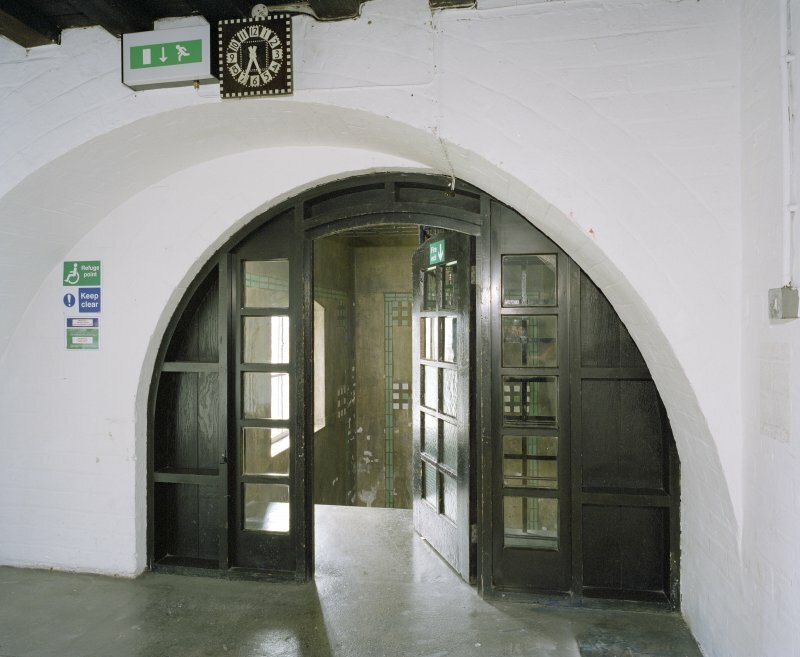 Doors and windows were extensively damaged and much of the fabric of all the walls, variously of brick and sandstone, was exposed. 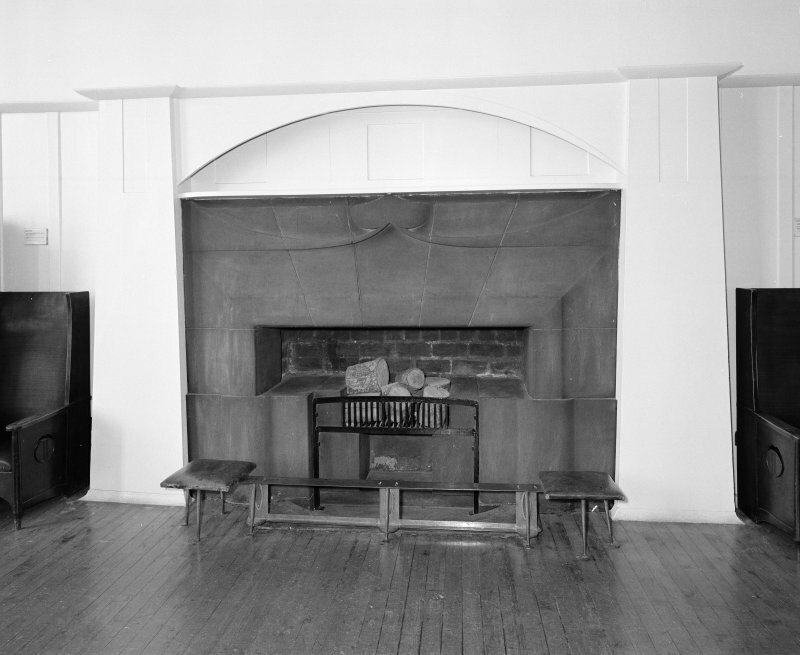 Some of the plaster and wood panelling, though damaged, remained in situ. 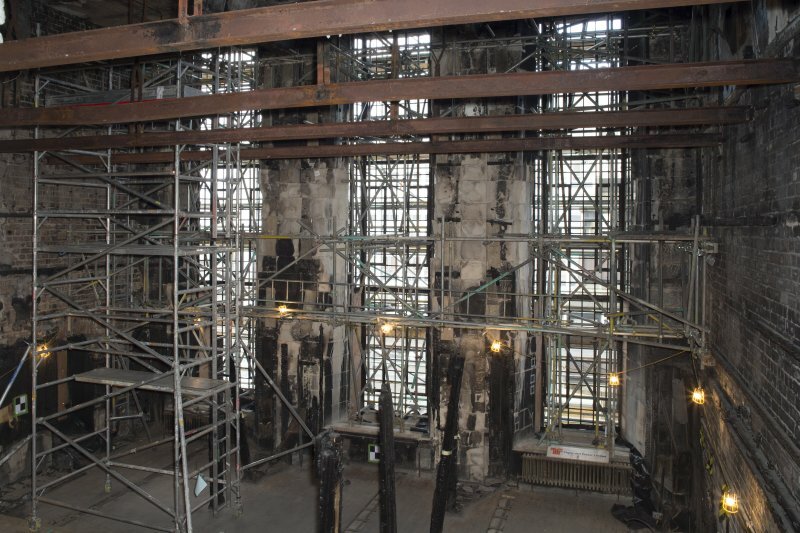 Approximately 80% of the floor area was excavated by hand, the remaining 20% was inaccessible due to collapsed flooring and proximity to insecure masonry overhead. 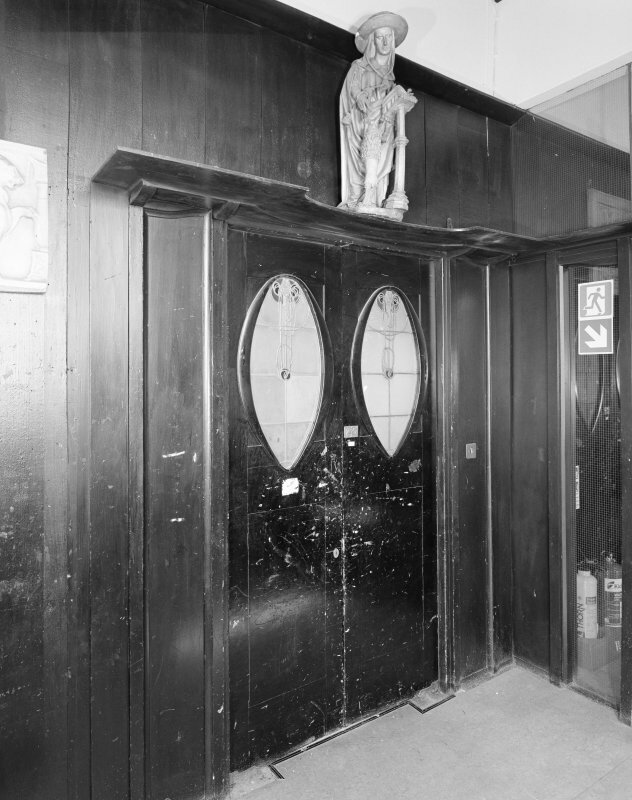 Material was photographed in situ, and its spatial location recorded prior to retrieval and further recording. 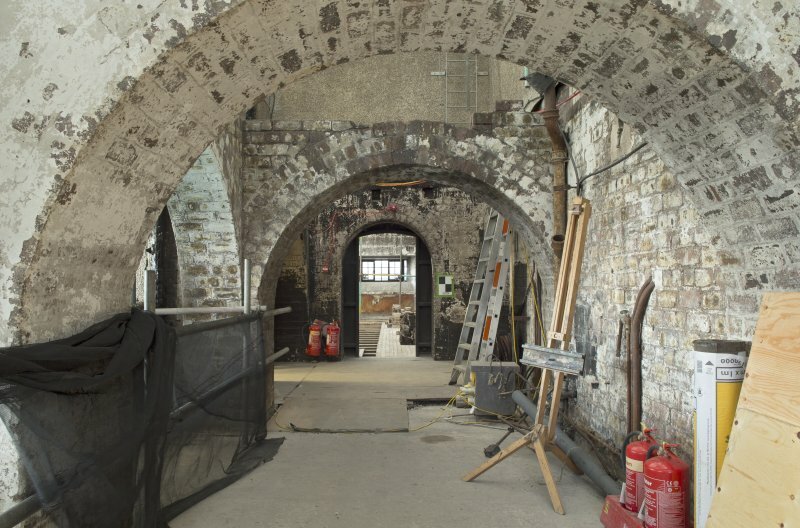 Of the general debris assemblage, individual items of significance were retained for post-excavation specialist attention. 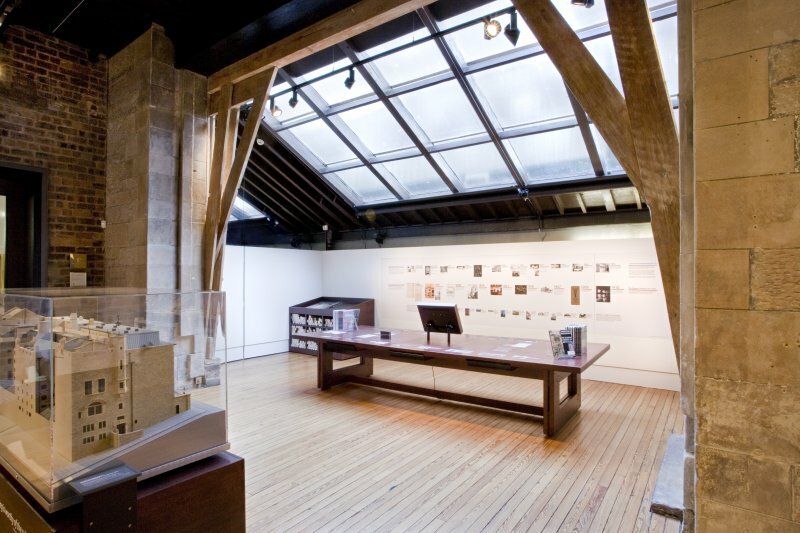 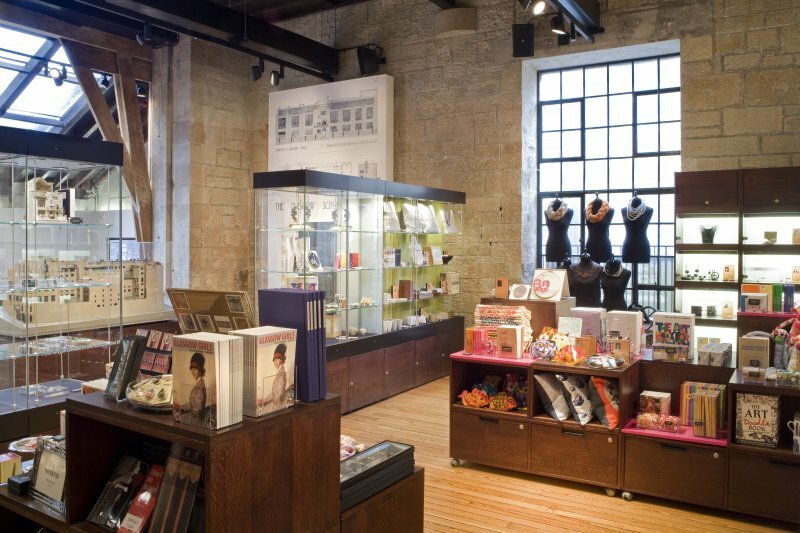 This included items of furniture, structural timberwork, books and structural fittings. 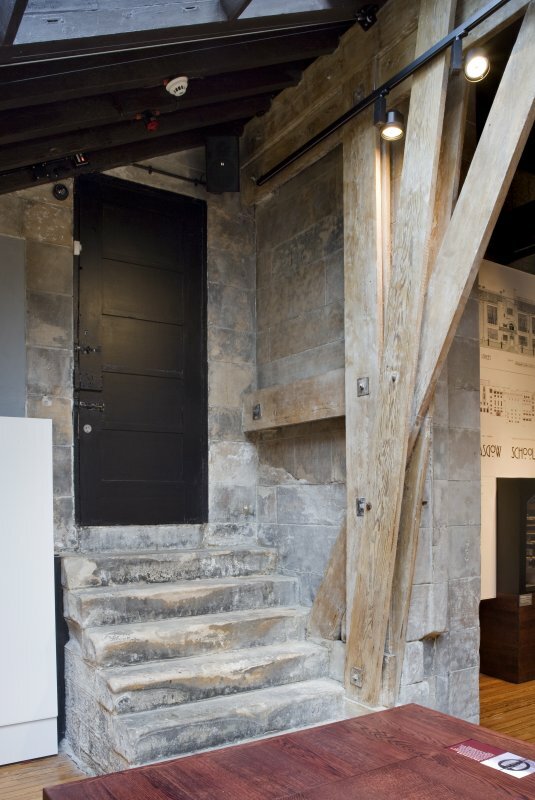 Sampled structural material, notably timberwork, was also retained for further analysis. 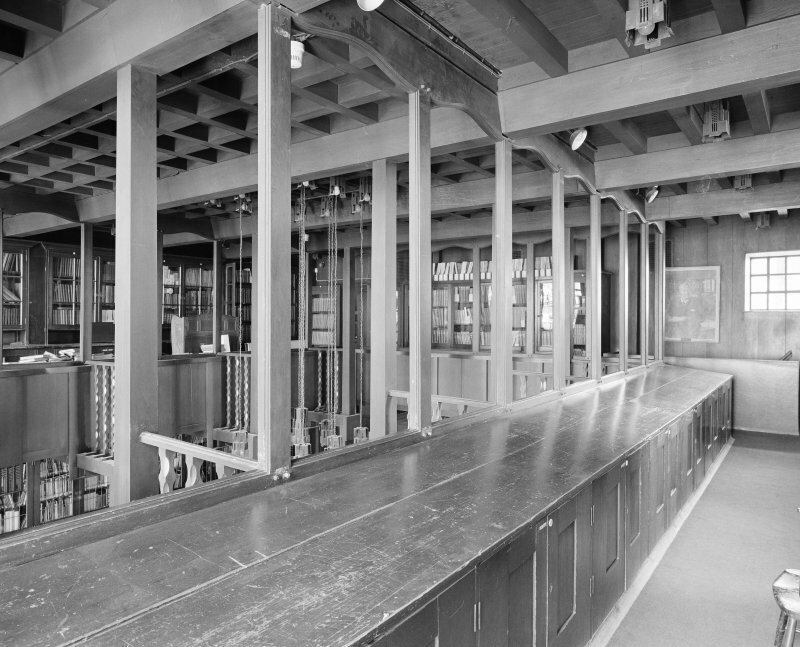 A baseline drawn record of the four elevations and the floor was completed, identifying and locating all surviving key structural features. 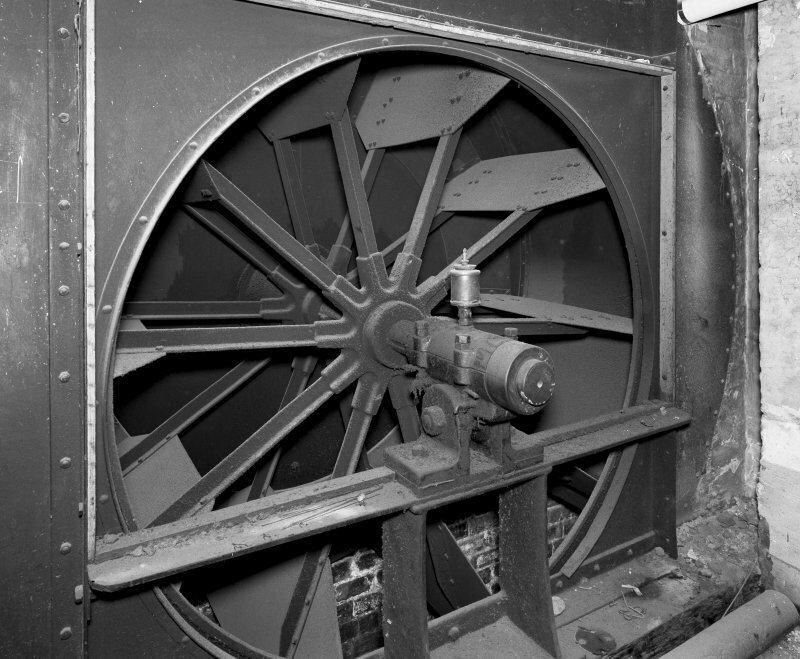 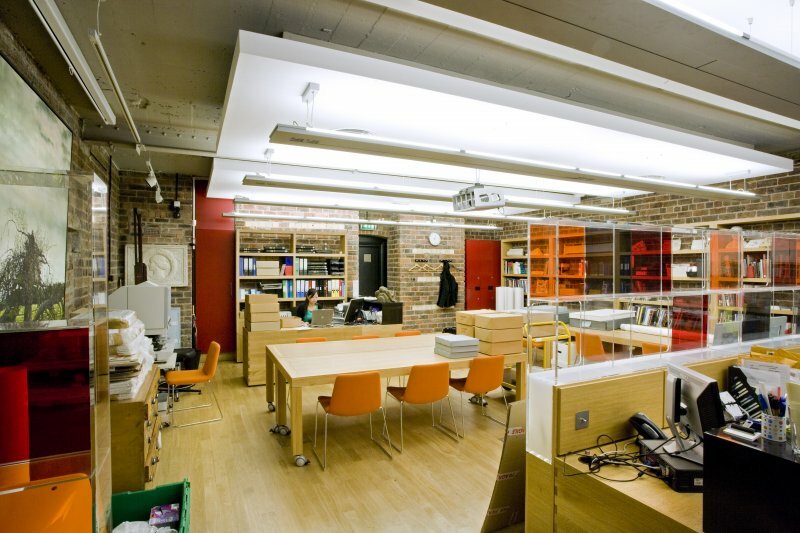 Evidence of various changes to services within the library was exposed, from the intramural heating ducts to successive hot water and electrical supply systems. 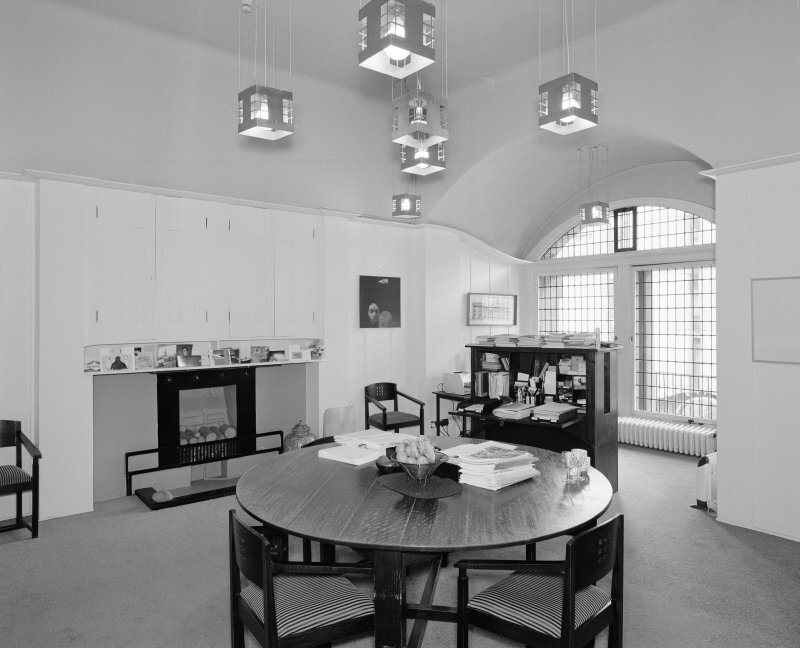 Alterations to the broader fabric of the library were also identified, defining the changes that this remarkable room has been subject to since its initial design and construction.